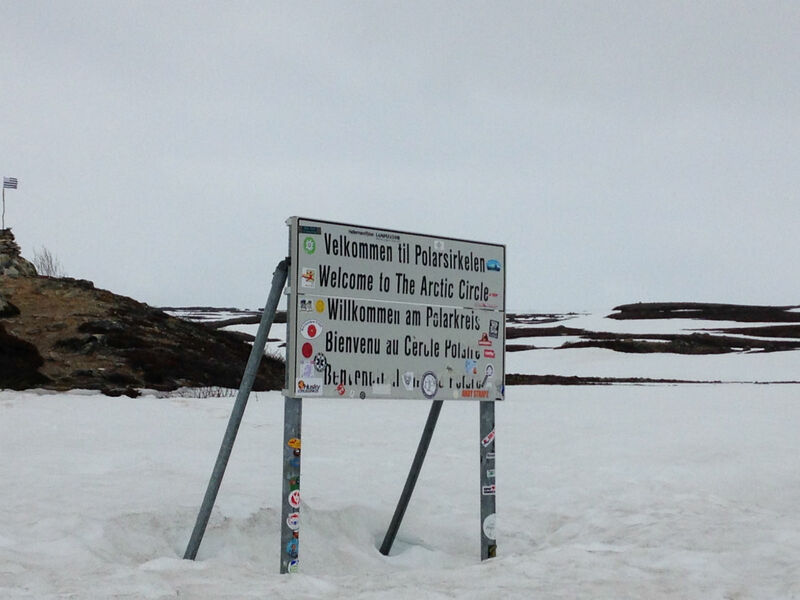 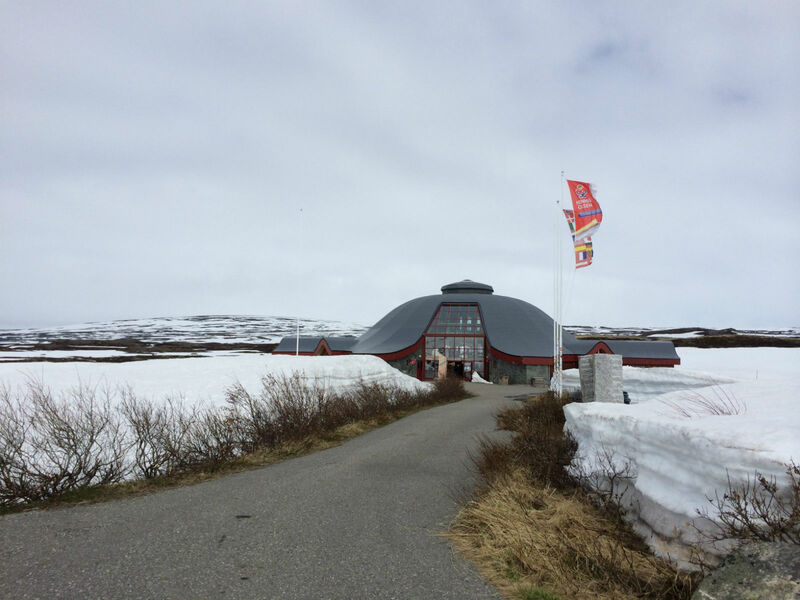 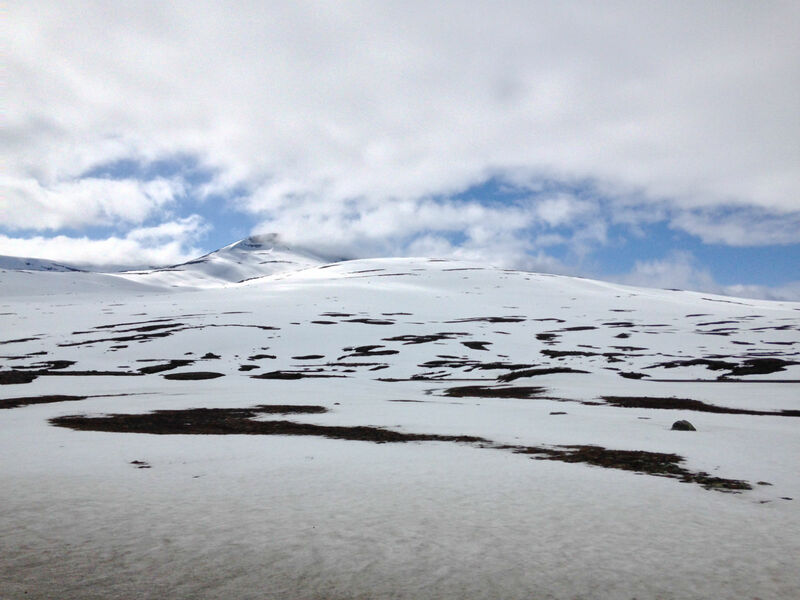 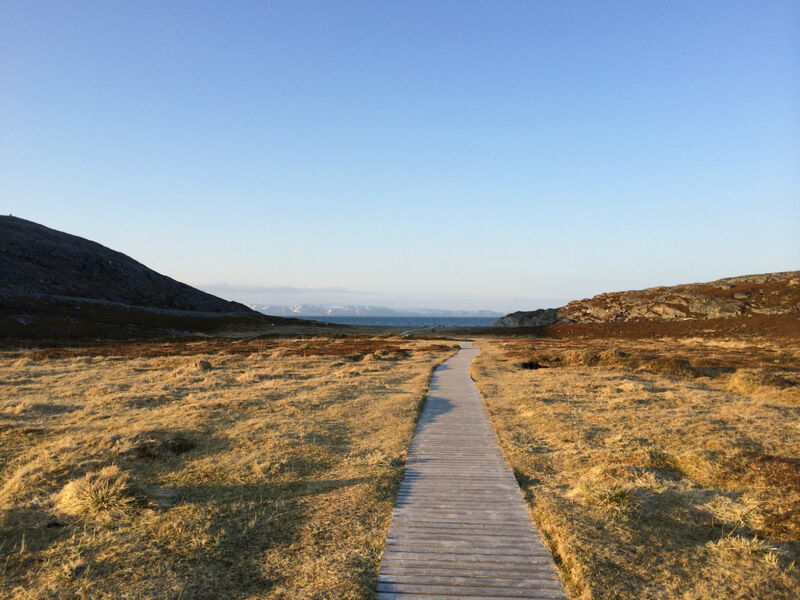 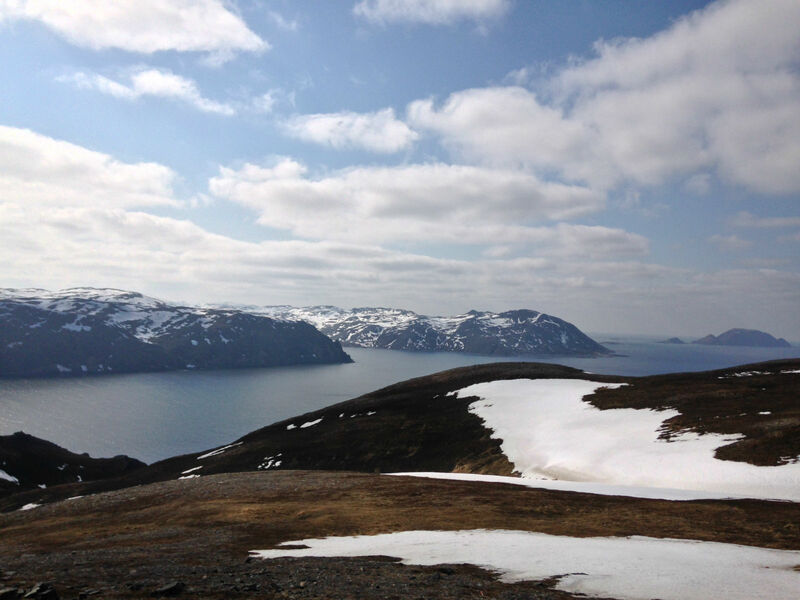 26 May, 2014 – We say goodbye to the North Cape and its unique landscape. 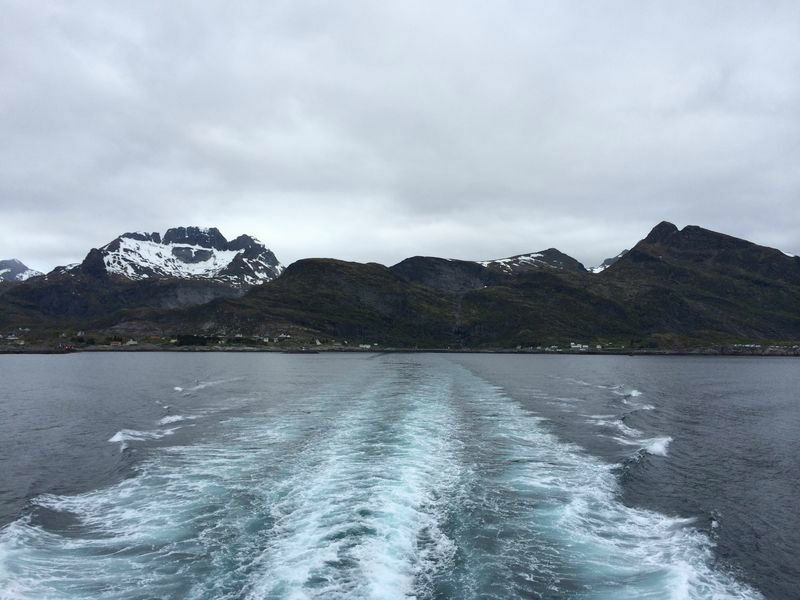 We now look forward to an almost two-week long trip through Norway. 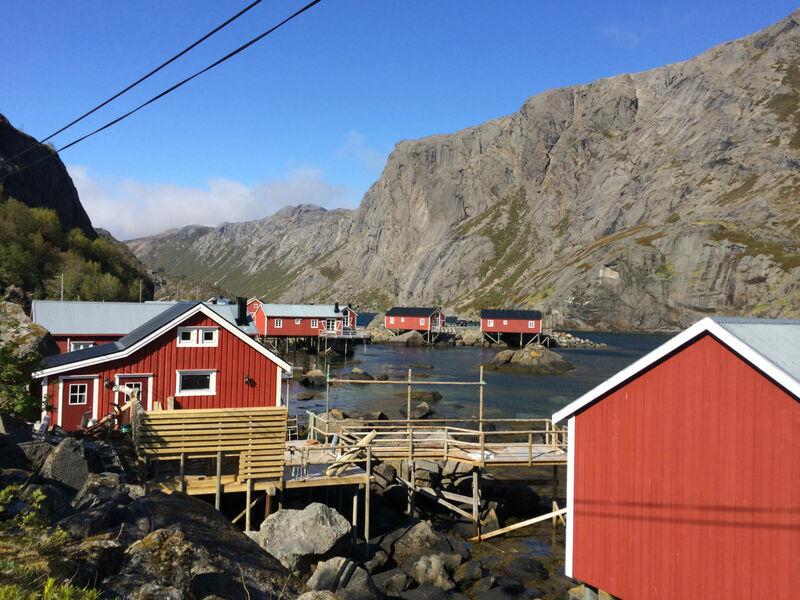 In Honningsvåg we take a break and try the recommended Café Corner. 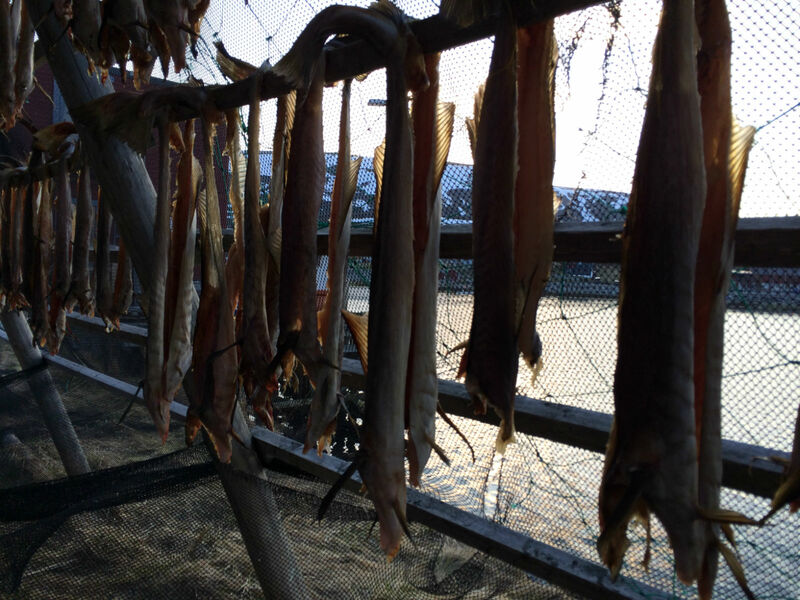 A bit pricey but very tasty! 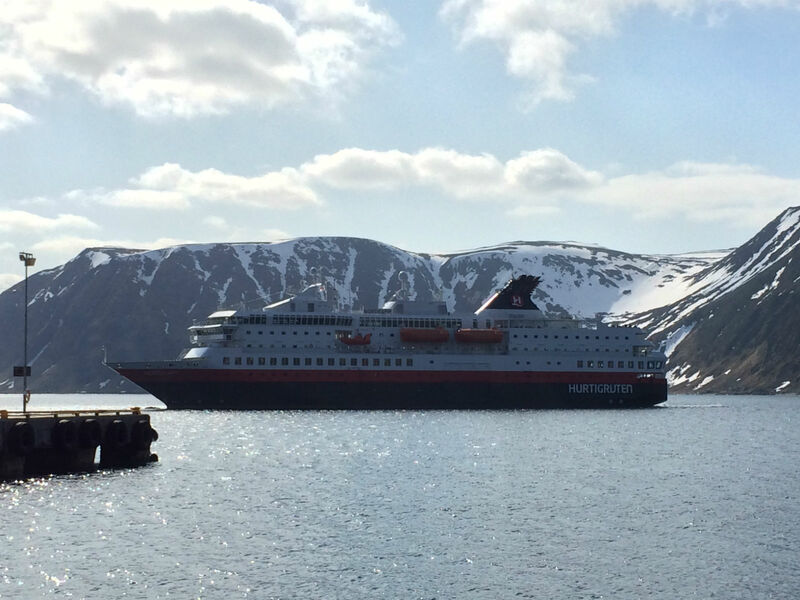 🙂 We see a Hurtigruten ship cast off and still shoot a farewell photo of the colorful houses in front of the harsh cliffs. 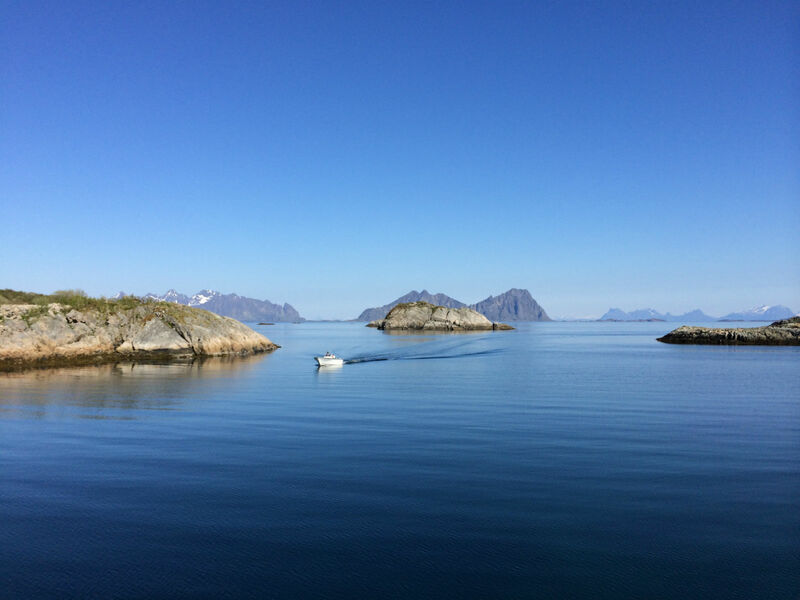 Today’s destination is a trip to the island Kvayøla. 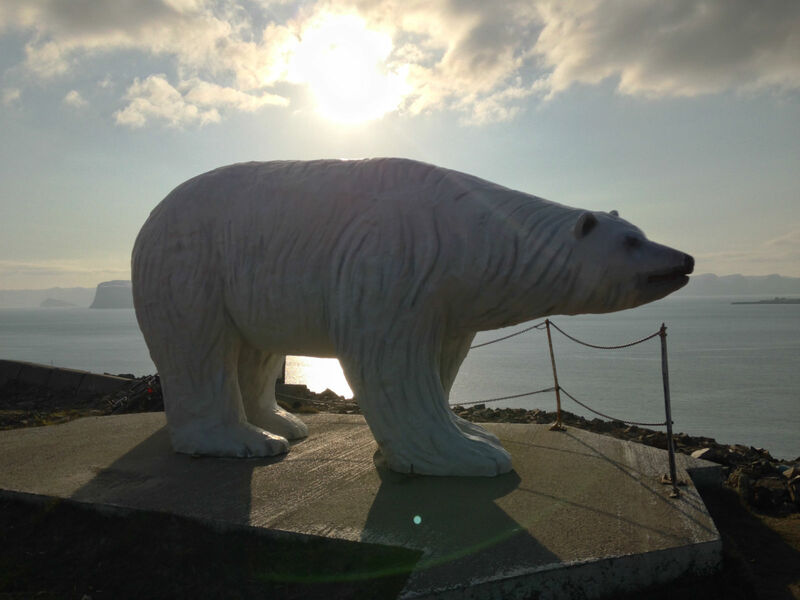 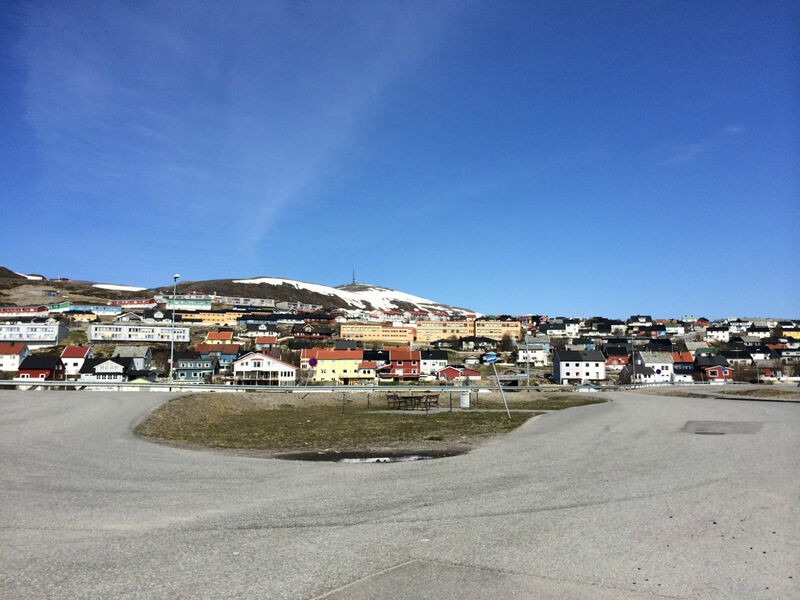 In Hammerfest, more precisely, in the small town Forsøl a little further north, it is supposed to be especially good for watching the midnight sun. 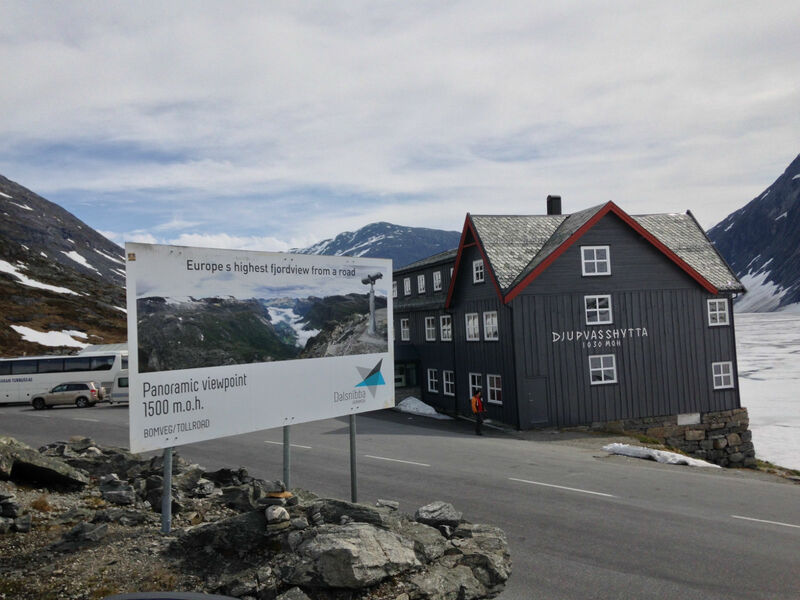 We have to drive around Forsøl a bit till we find the perfect spot. 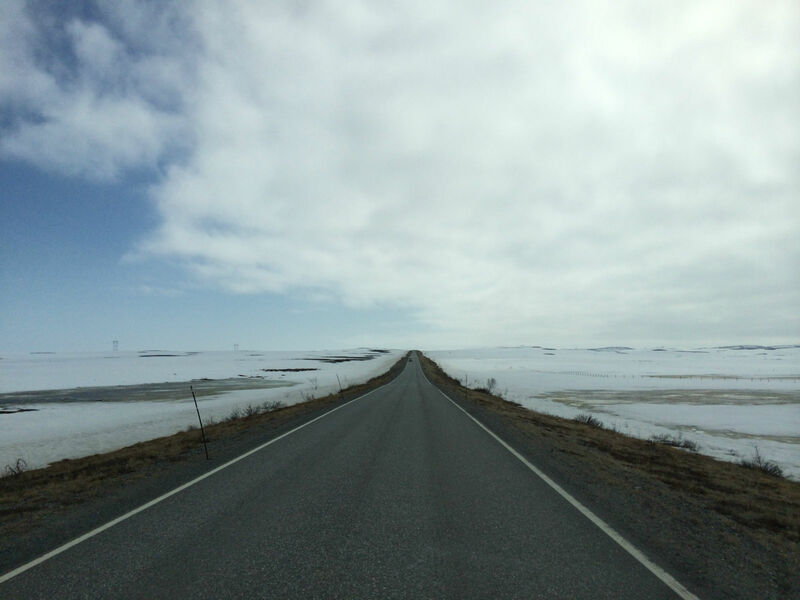 In fact, we follow the Fv391 and then turn right onto the road Langbuktveien. 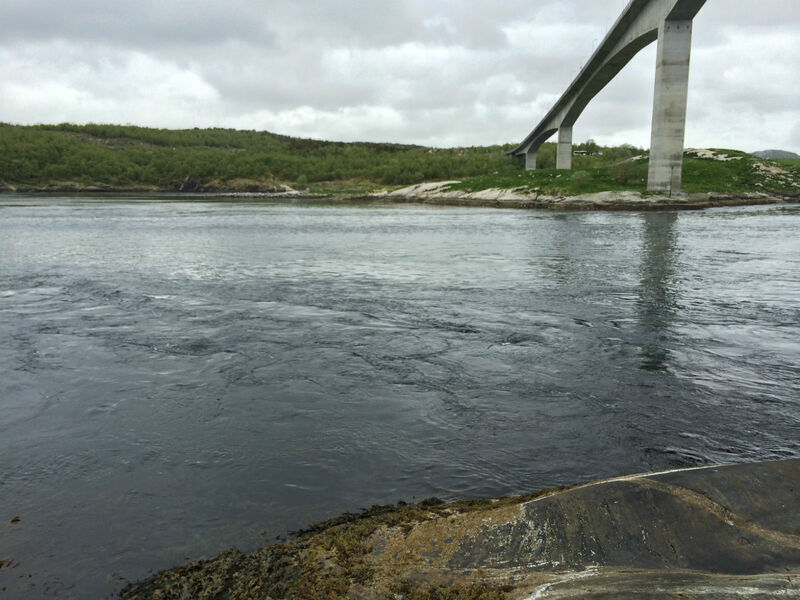 Pass two small fisheries which are followed by a free gravel space. 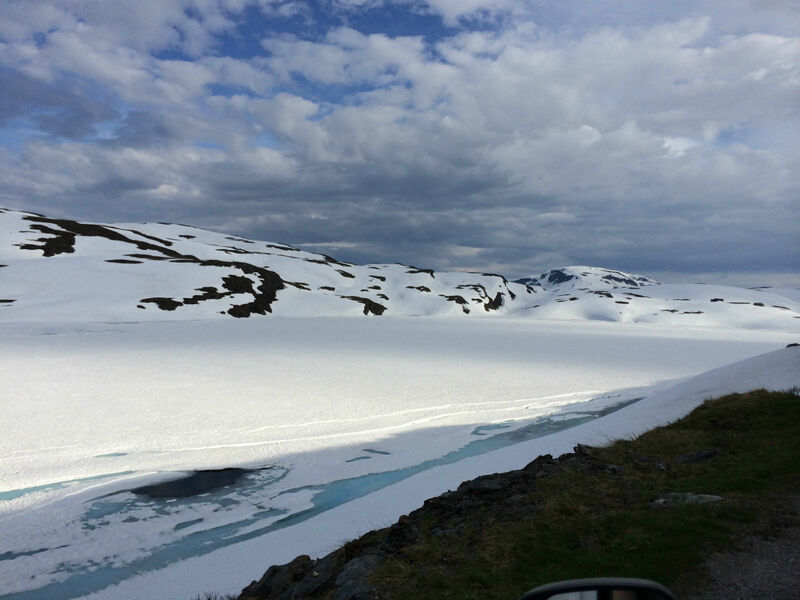 There we set up our camp for the night and with a walk explore the area a bit. 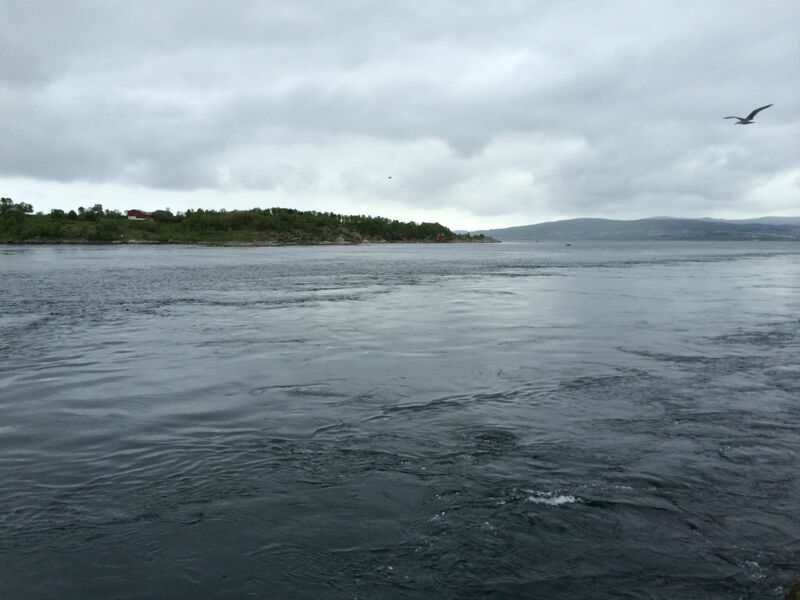 Very close by, a small bay, Kjerkegårdsbukta, is located. 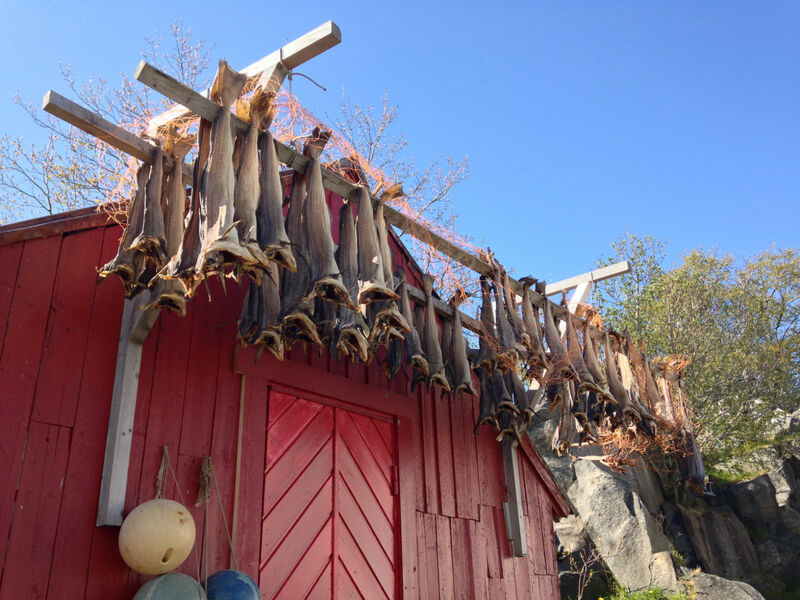 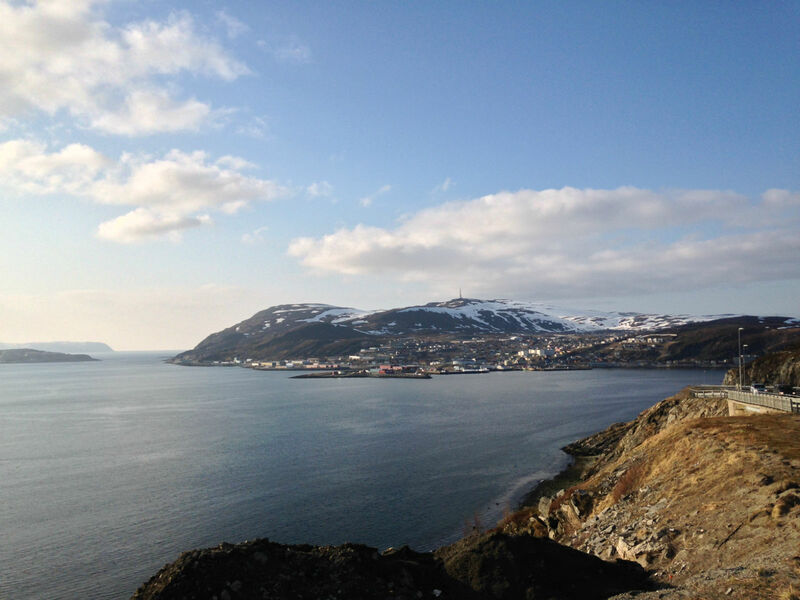 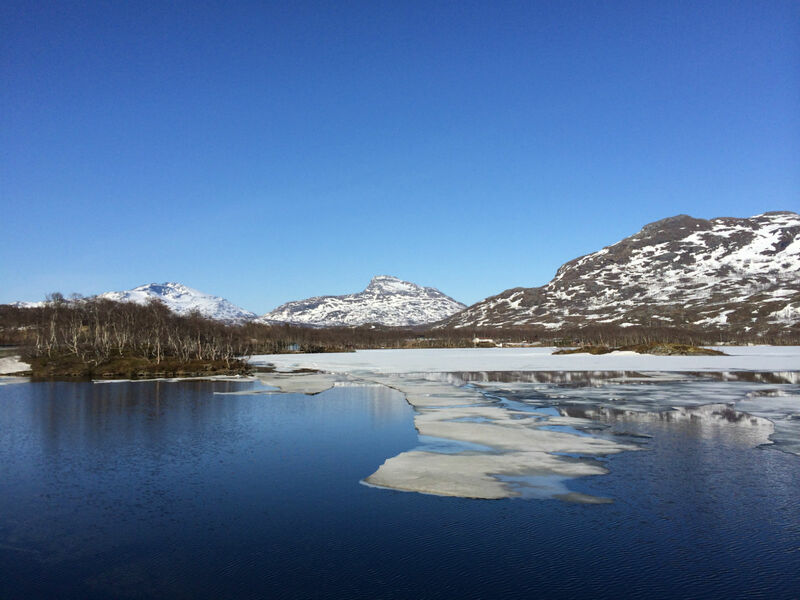 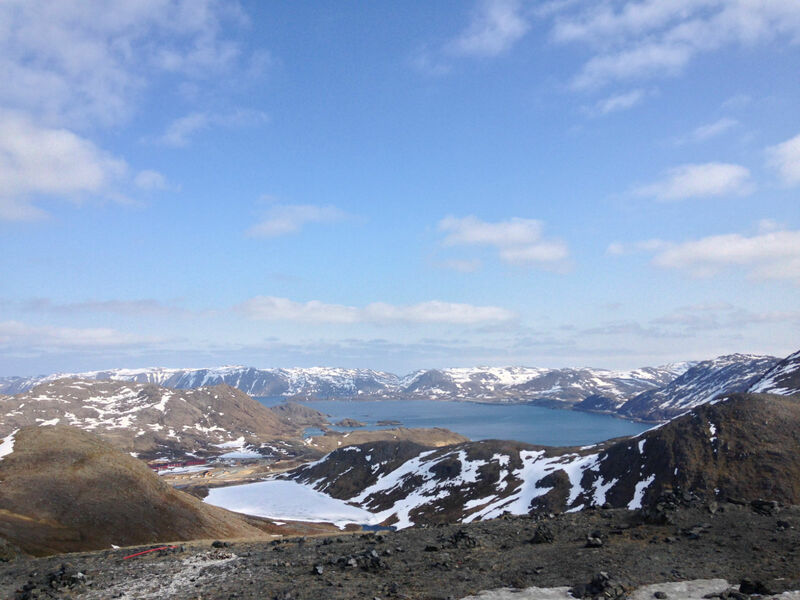 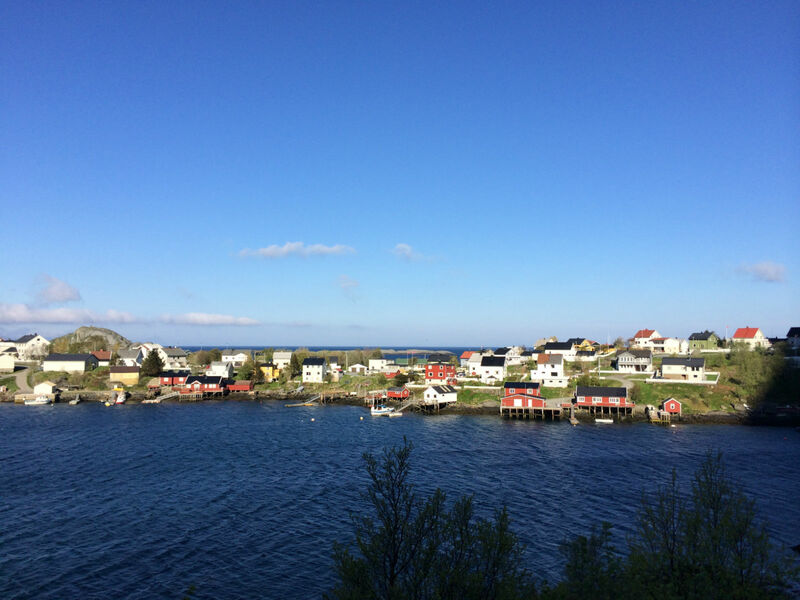 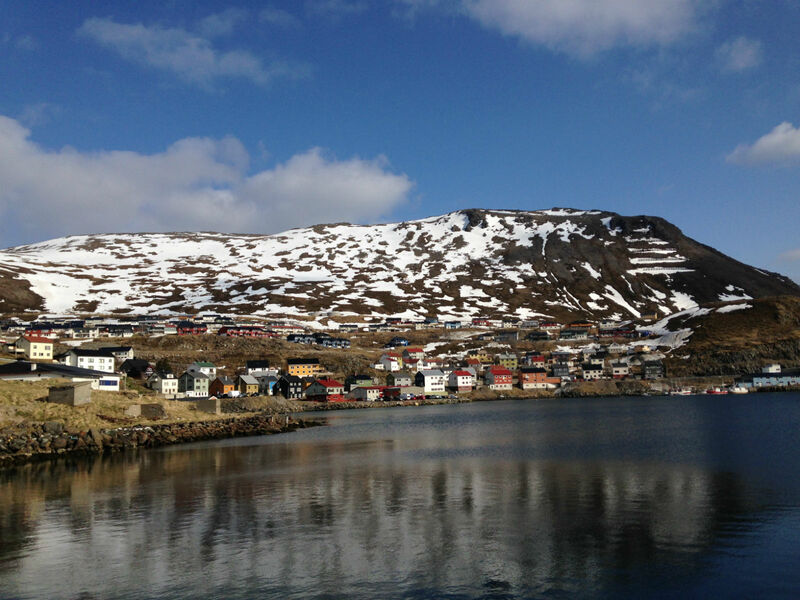 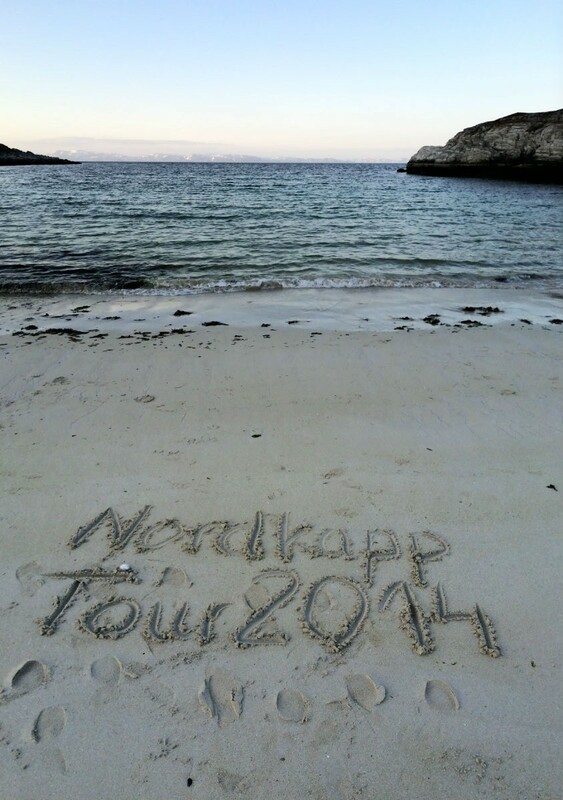 27 May, 2014 – We leave in the direction of Hammerfest, also known as the northernmost city in Europe. 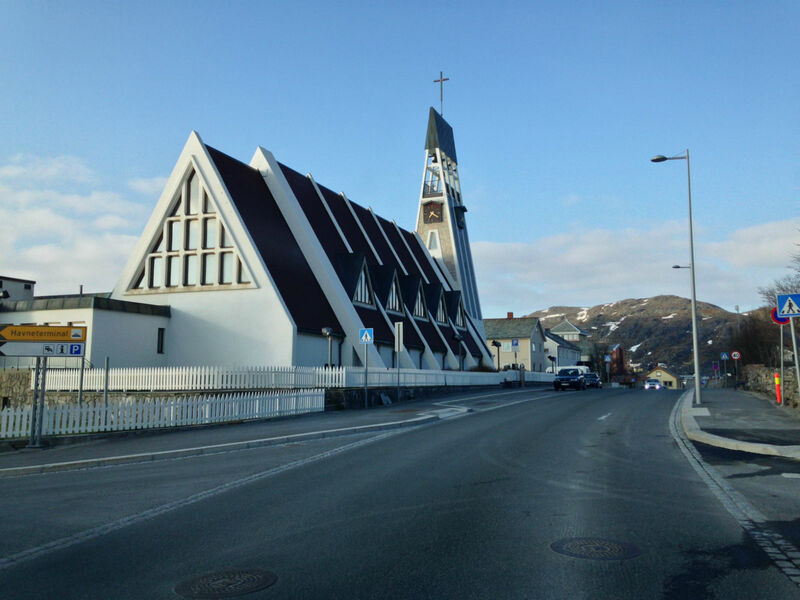 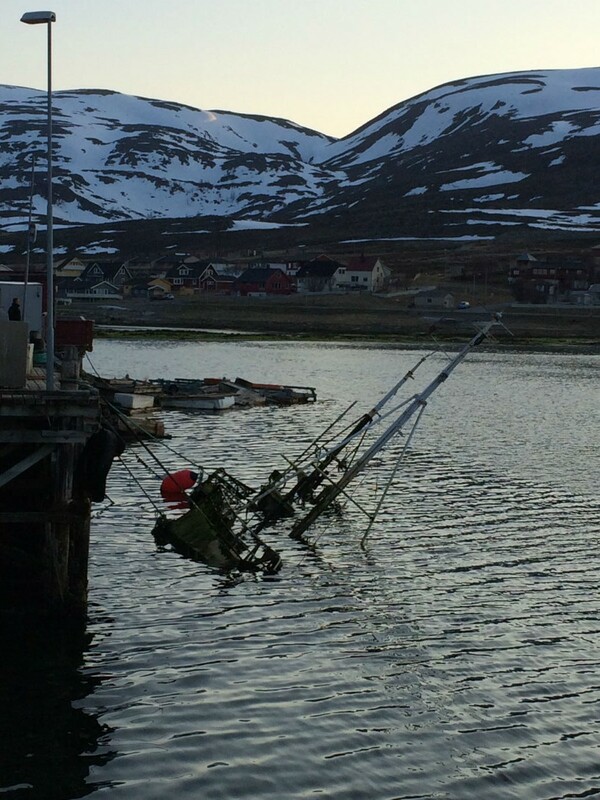 This is precisely Honningsvåg, but we do not want to be petty. 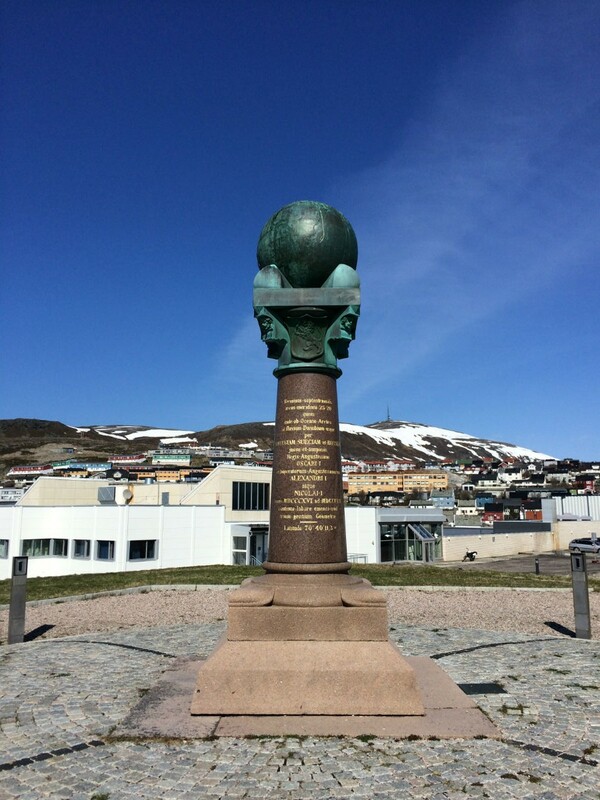 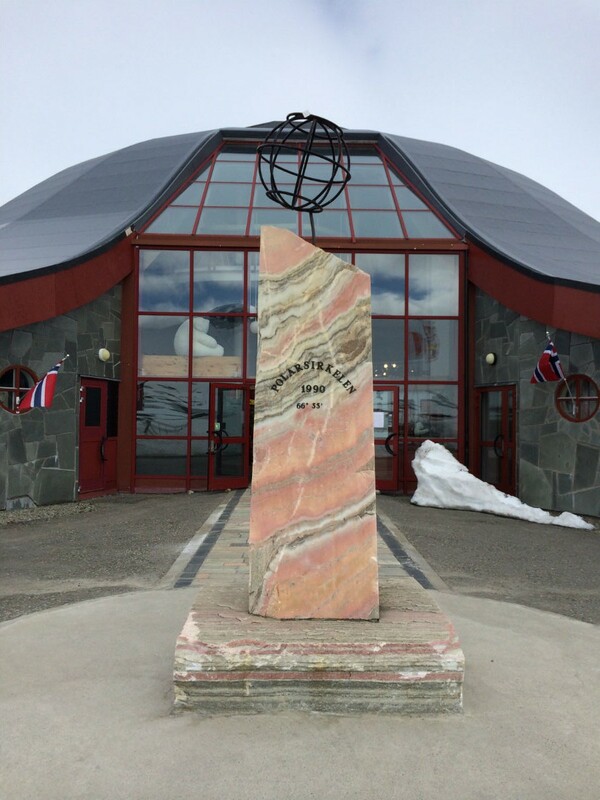 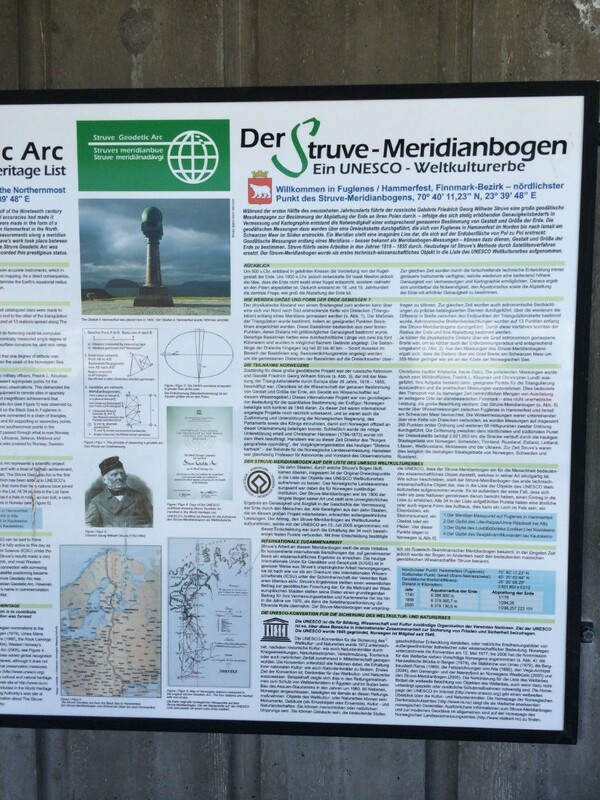 😉 In Hammerfest, especially interesting for us, is the Meridianstøtten; a globe upon a granite pillar, as a reminder of a geodesy from the 19th century. 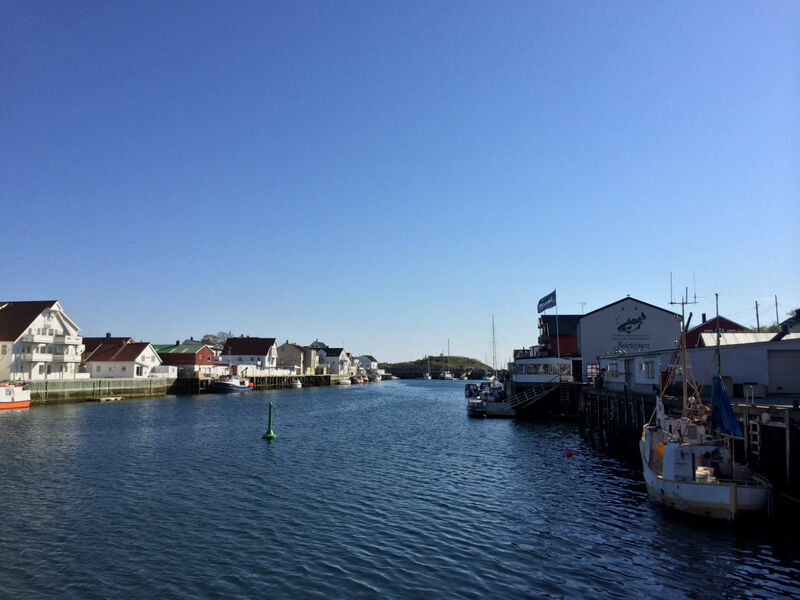 29 May, 2014 – We have breakfast directly by the water. 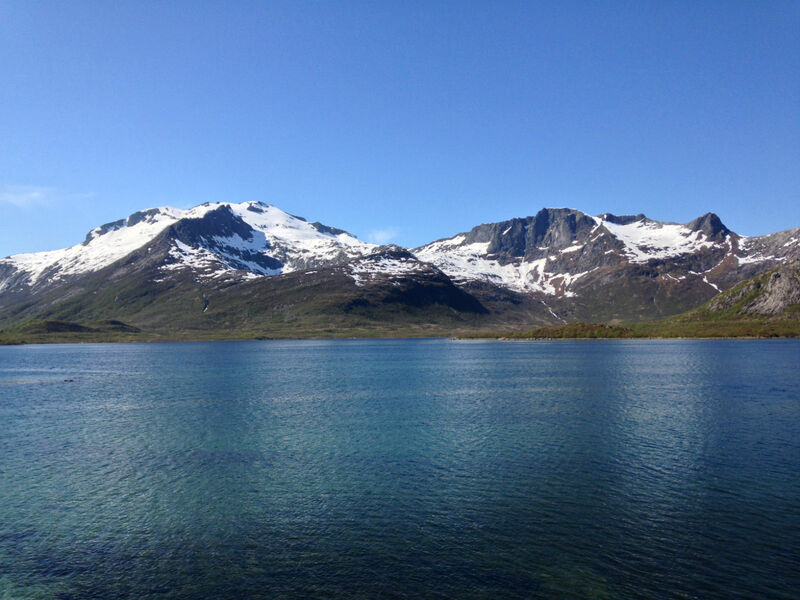 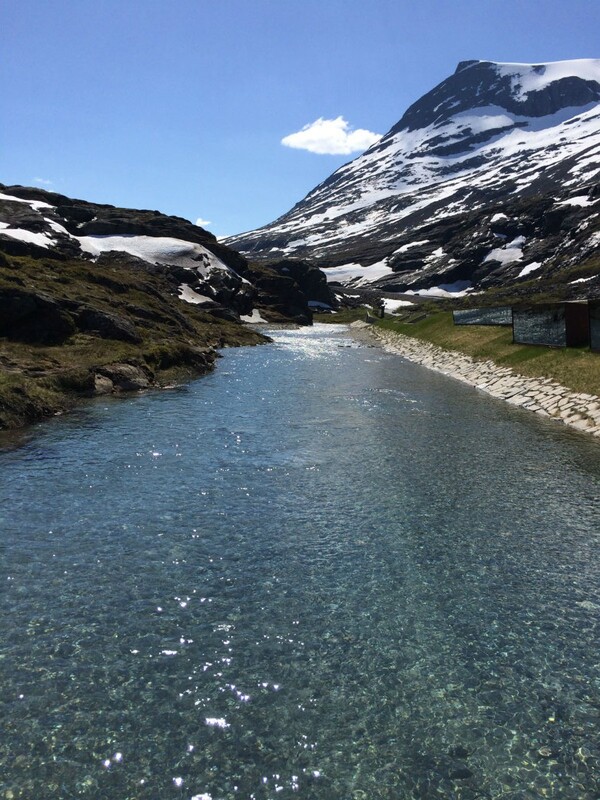 The scenery is really perfect: high snow-capped mountains, clear water surrounded by green meadows and forests. 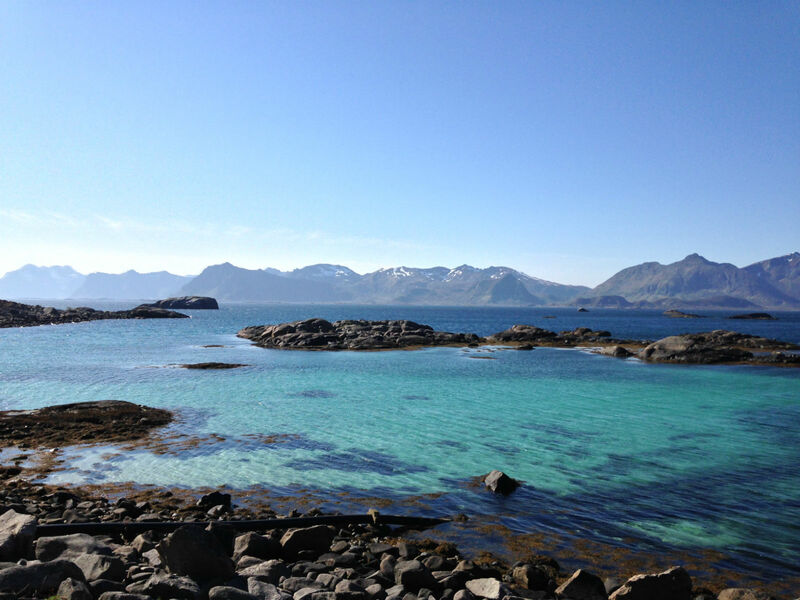 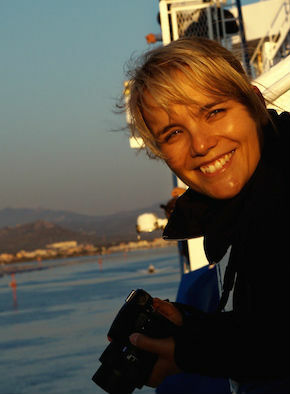 The plan is to drive along the 150 km Lofoten and take a ferry to Bodø, in Moskenes, to return to the mainland. 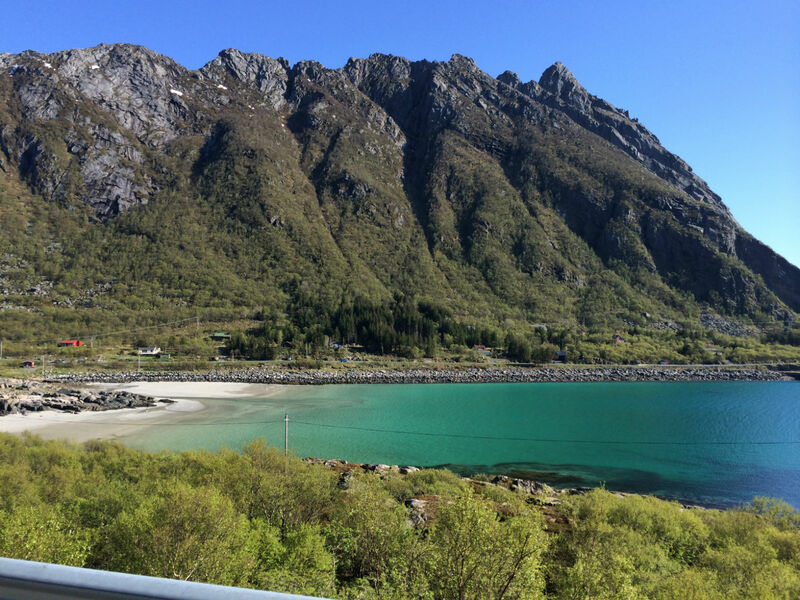 Since we could not say exactly when we would reach Lofoten and how long we would want to stay, we did not book the ferry in advance. 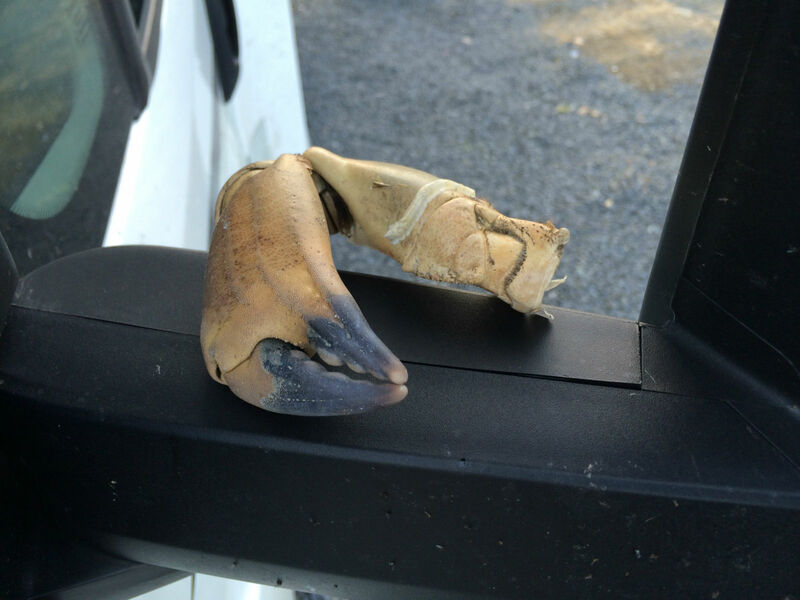 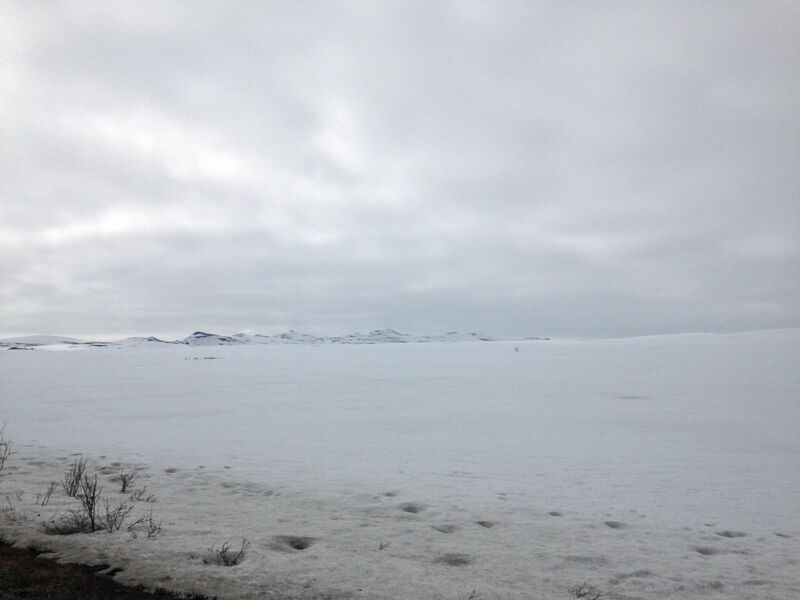 As we are traveling in the off-season it is not a problem. 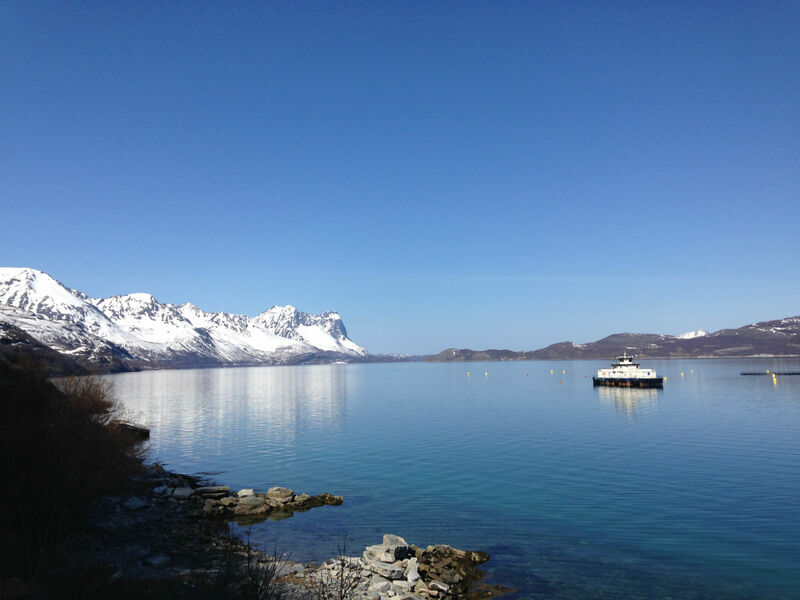 During high season it is recommended to reserve the ferry early. 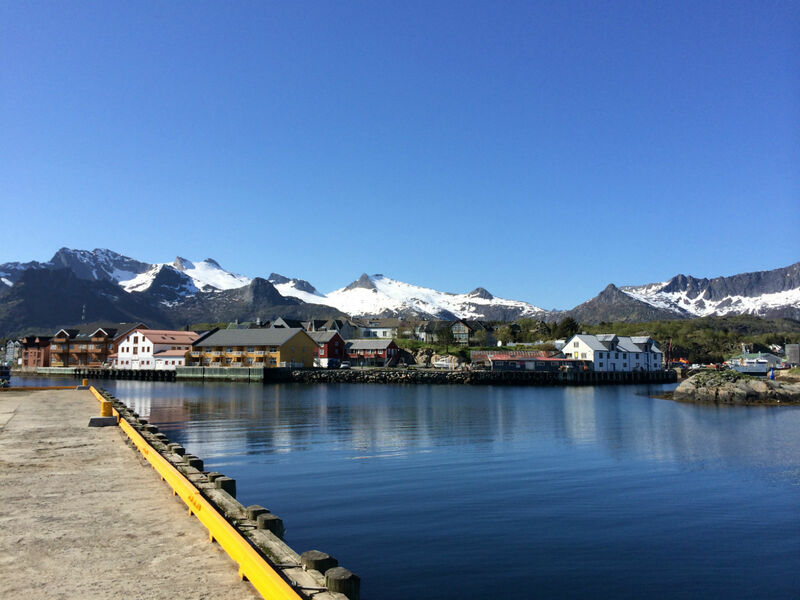 First we head for the small town Kabelvåg. 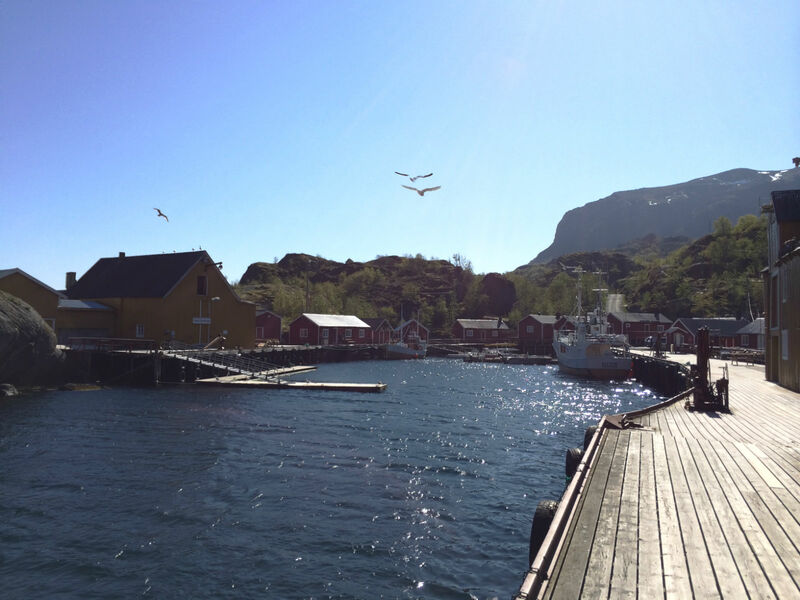 We then make a detour to the beaches of the Bay, Vikspollen. 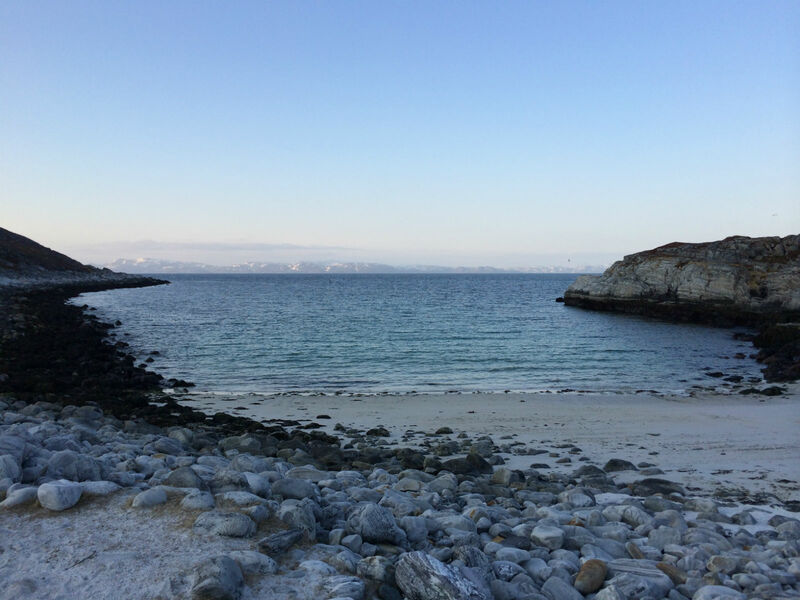 In the evening we reserve the ferry Moskenes-Bodø for the next morning. 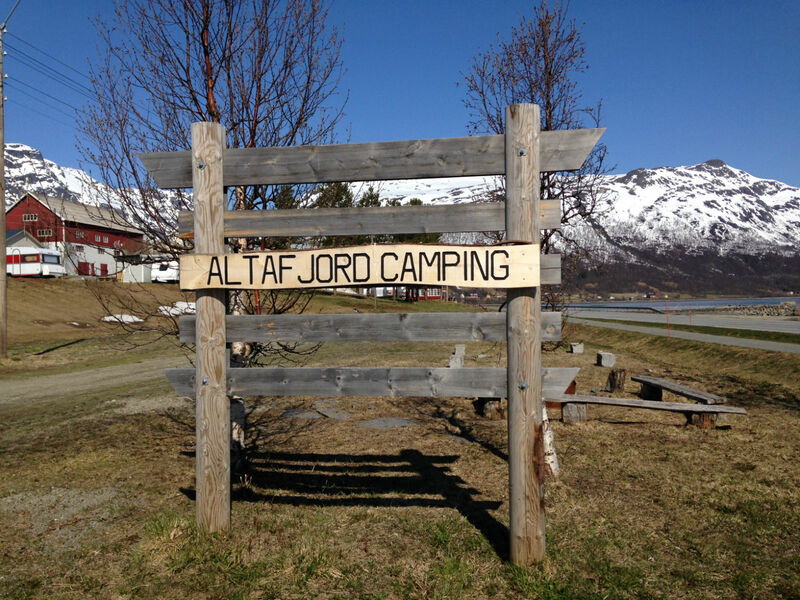 The 4-hour trip costs, per mobile home, over 250 euro! 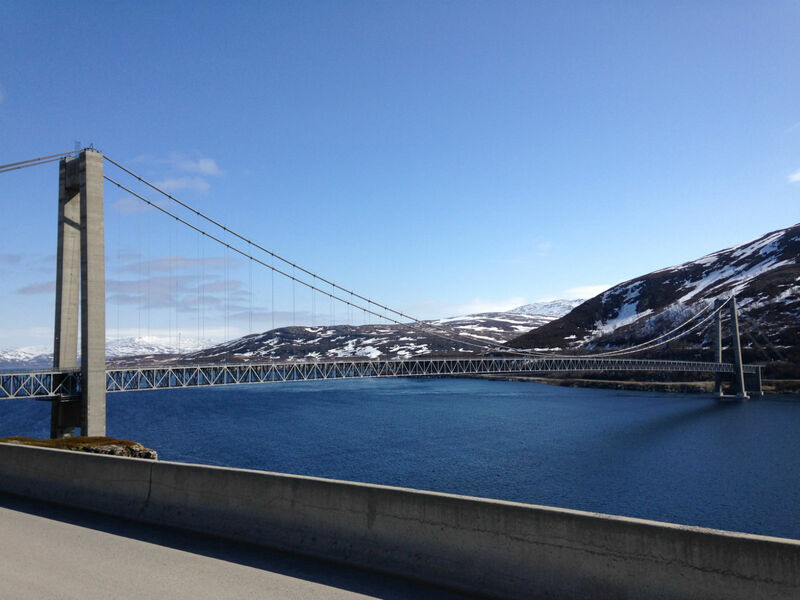 So it would be a real alternative, to drive back the 150 km and then drive the 300 km across the mainland to Bodø. 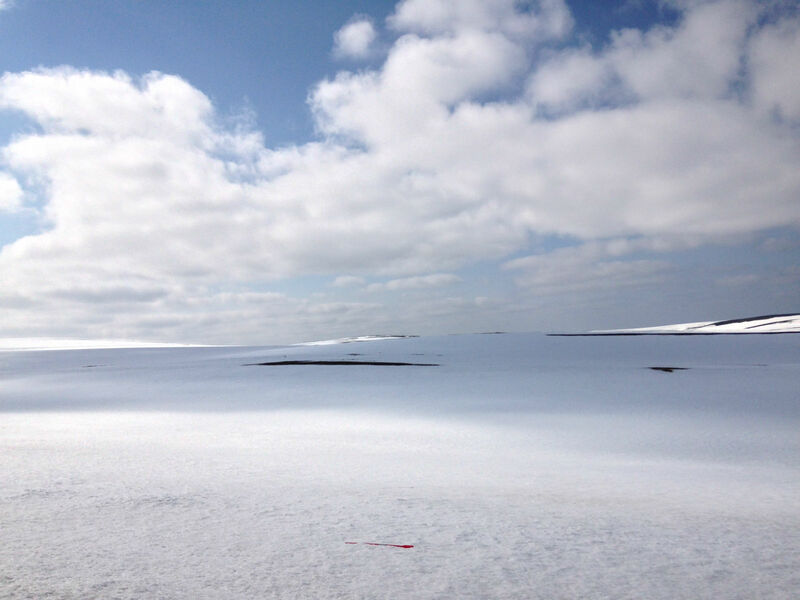 We would however lose a valuable day, which we do not want to give up. 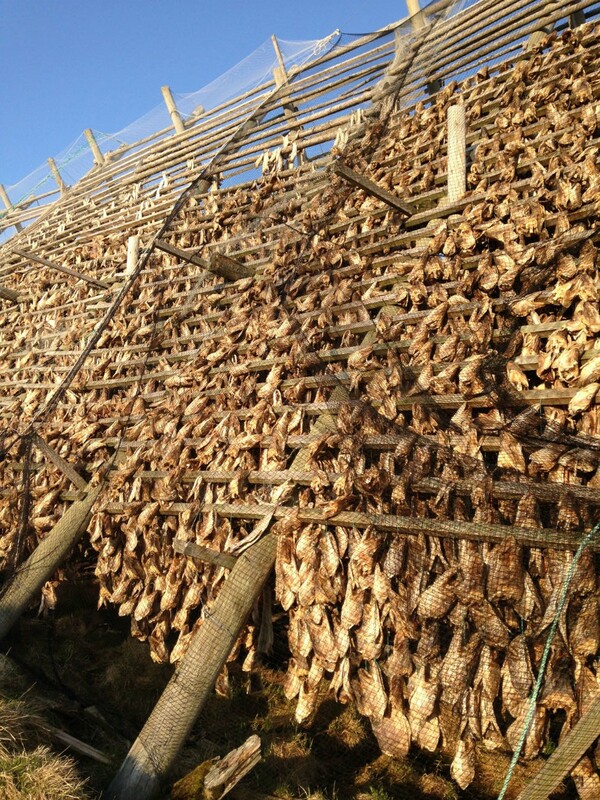 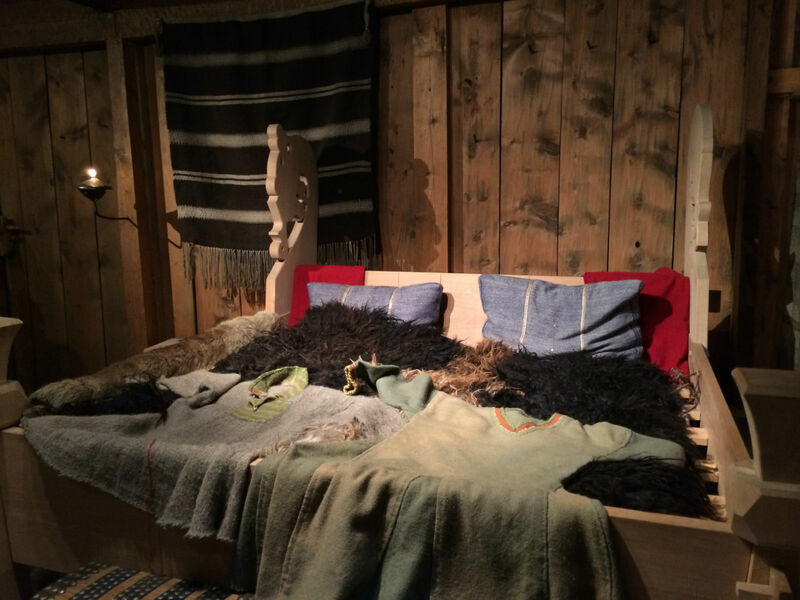 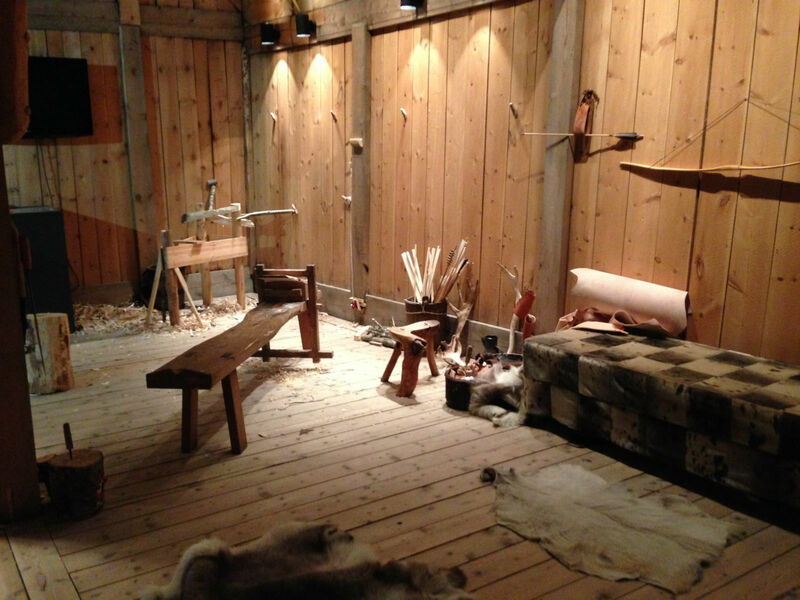 30 May, 2014 – Let’s go to the Viking Museum in Borg! 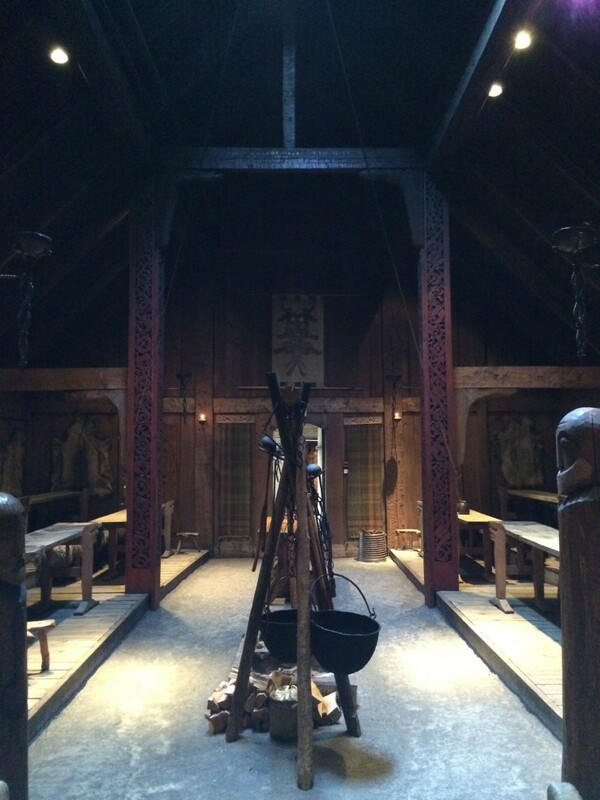 Although – due to preseason – not everything was open, the Viking Museum is worth a visit in any case. 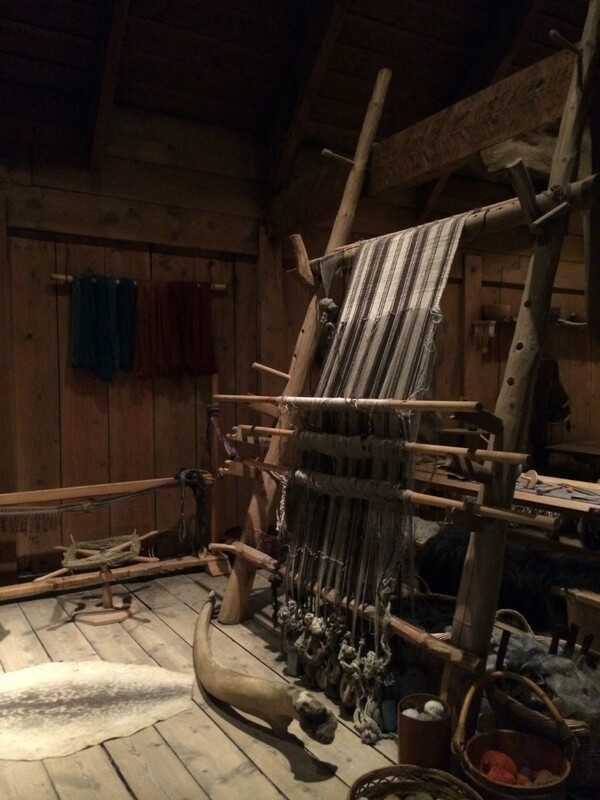 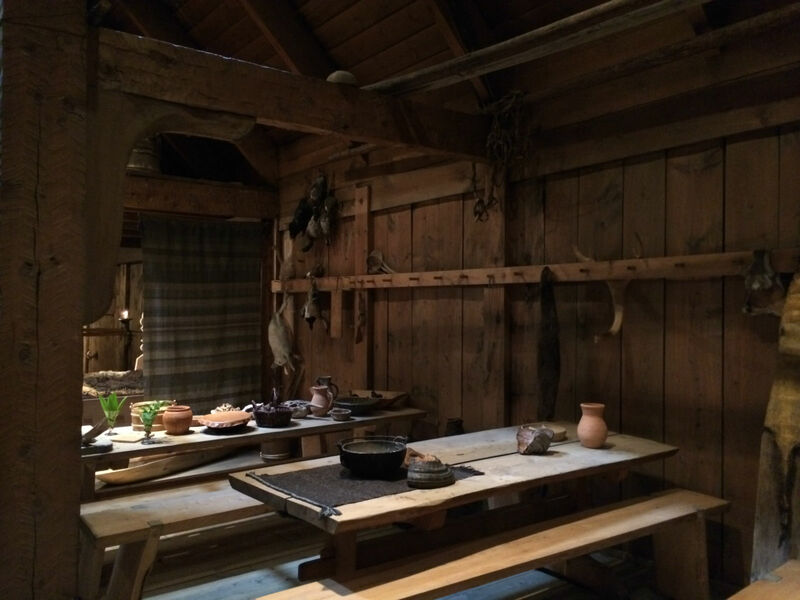 In addition to a short film in the cinema and an exhibition with audio guide, the life and craft of the Vikings is simulated in reconstructed old Viking buildings. 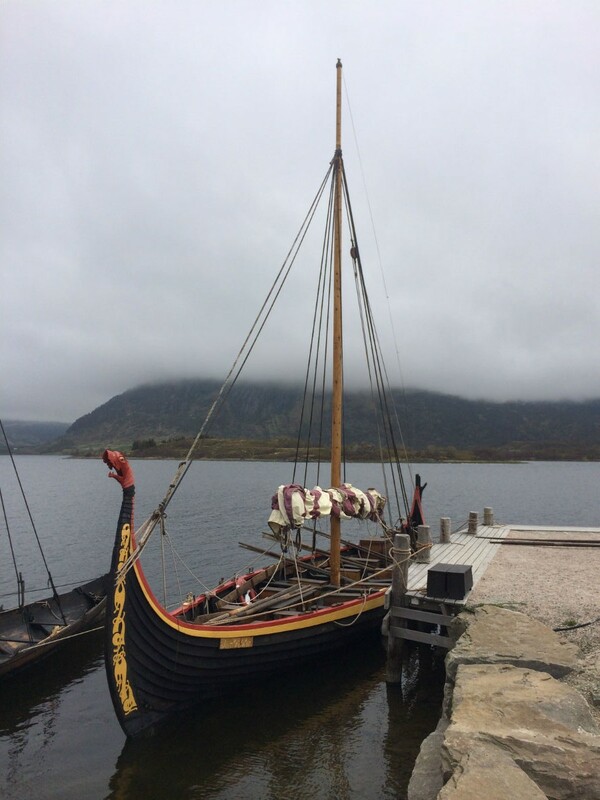 Then you can also still take a 10-minute walk to the Viking Ship, which, during high season, may also be rowed. 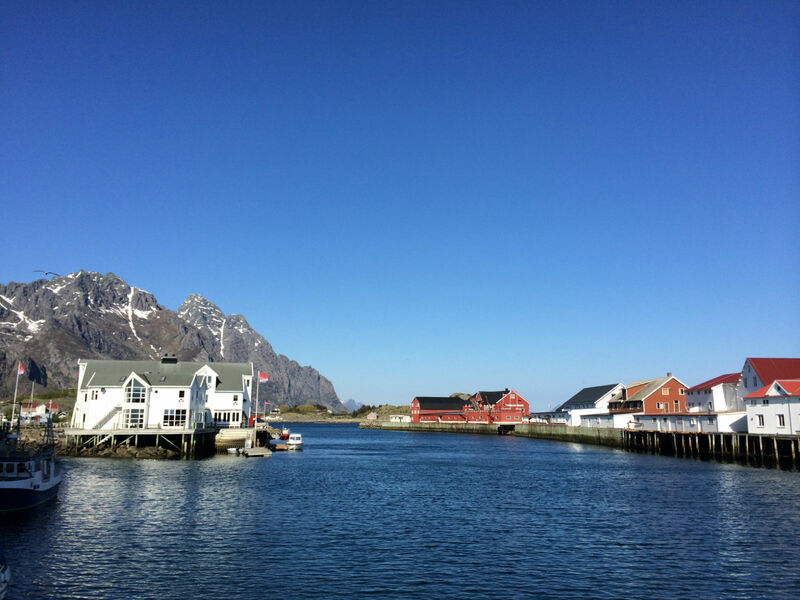 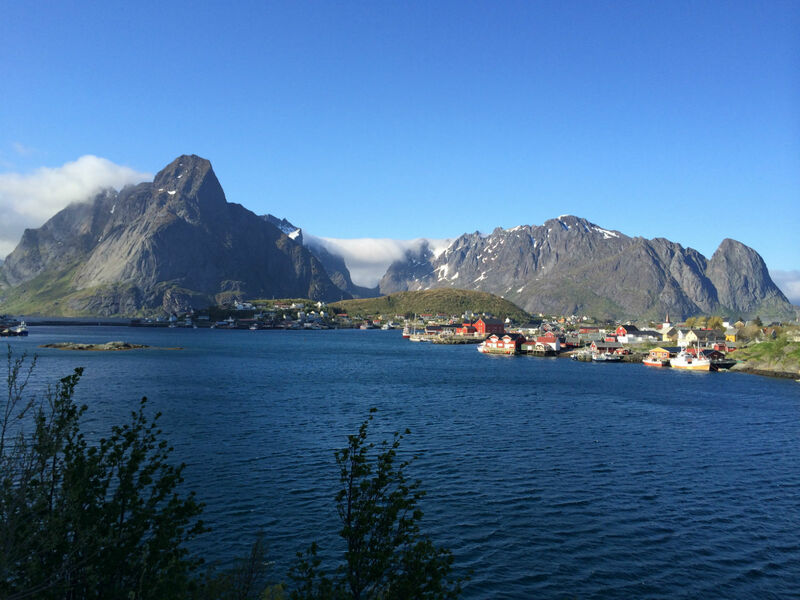 With a stopover in the beautiful fishing village of Nusfjord, Reine and the end point of Lofoten – the village of Å – we finally arrive at the ferry port in Moskenes. 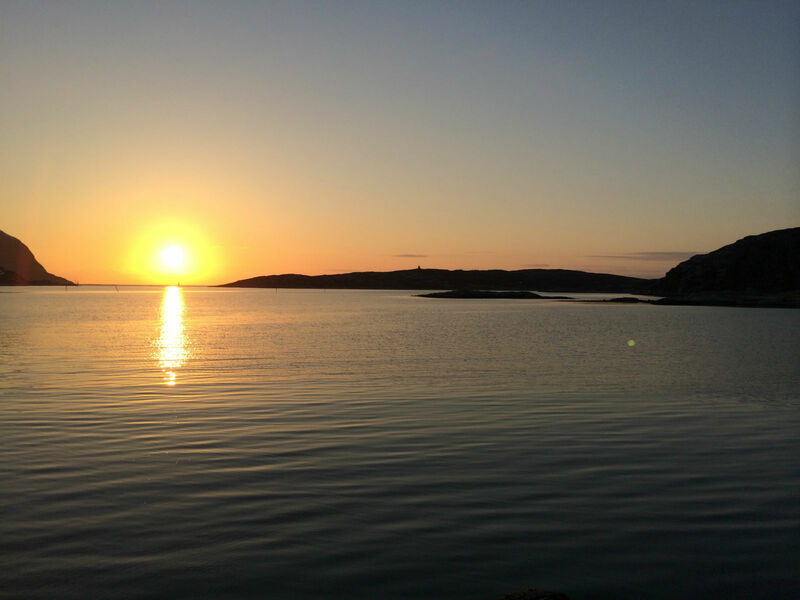 There we spend a restless night between trucks, before we head once again to the mainland the next morning. 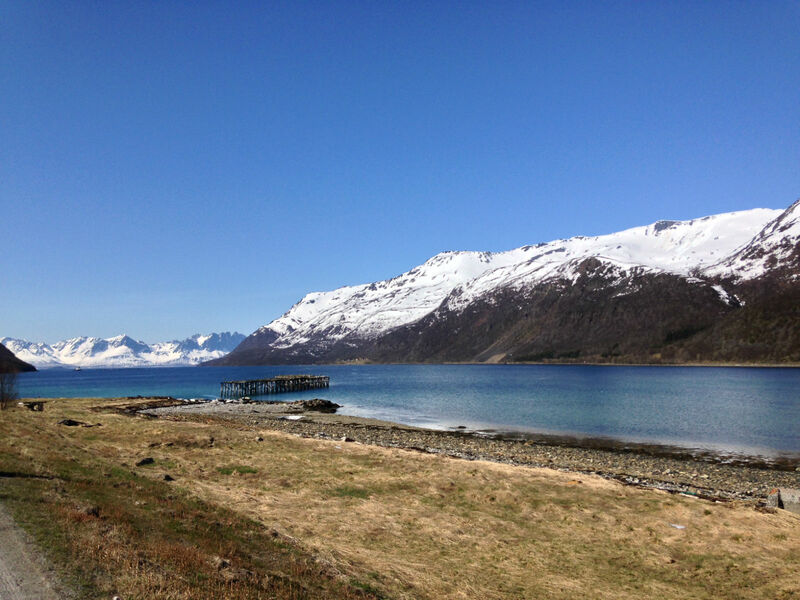 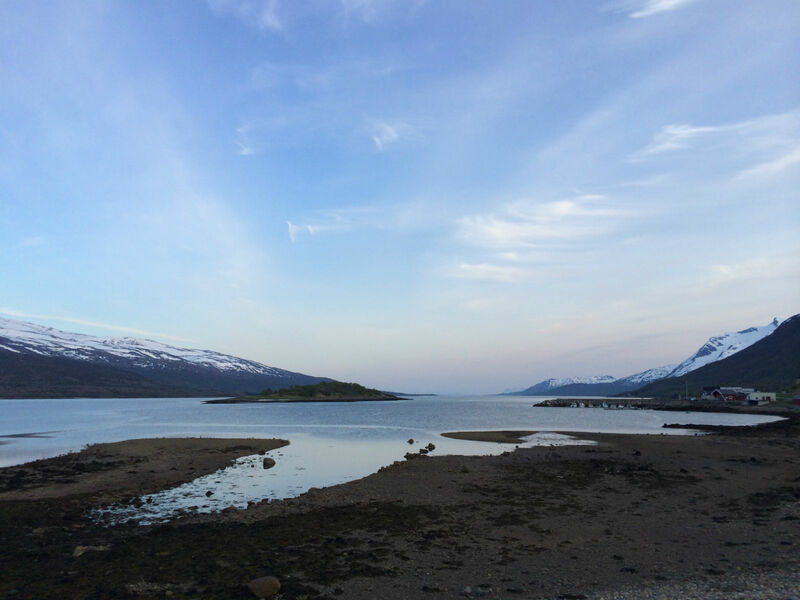 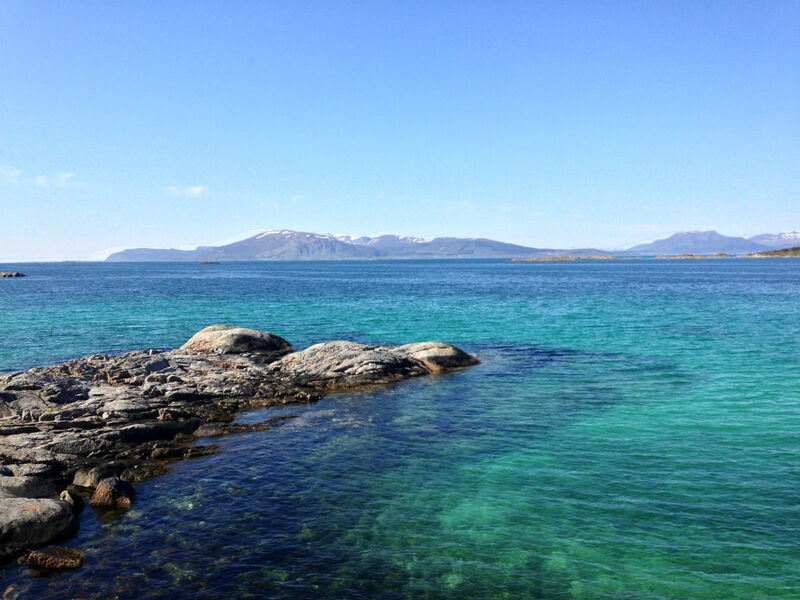 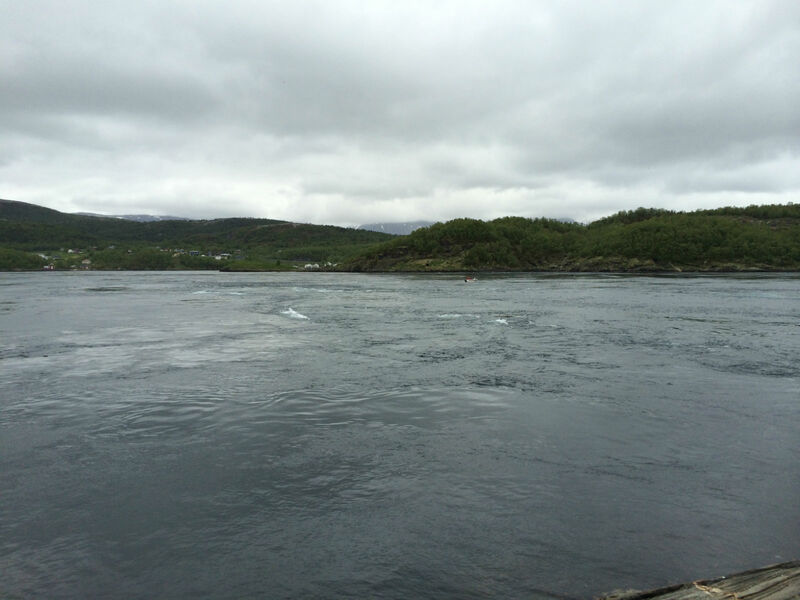 31 May, 2014 – Once we arrive in Bodø, our first destination is the tidal current of Saltstraumen. 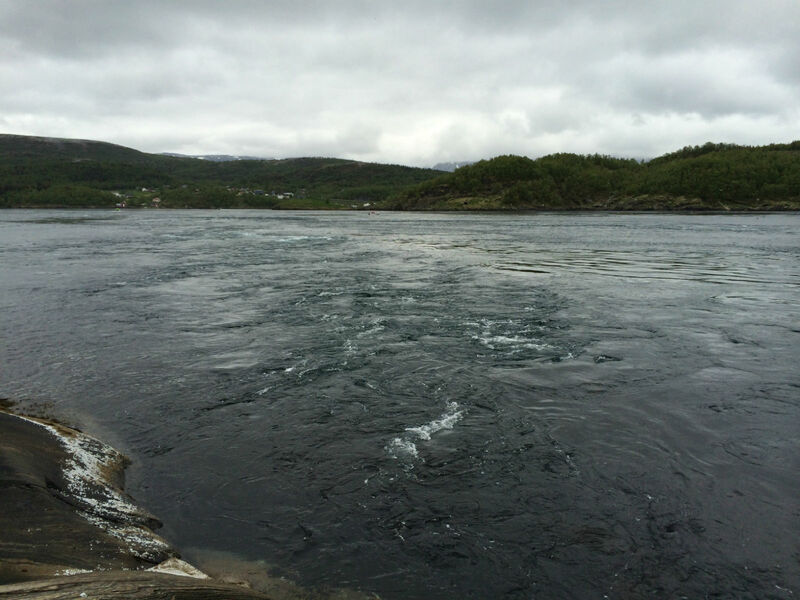 In the information center, we learn that we have to wait an hour to be able to observe the strongest current. 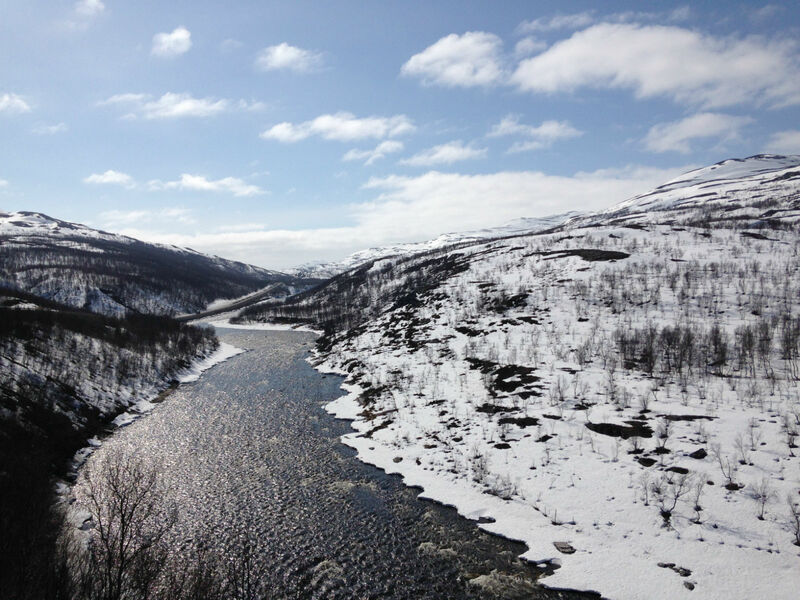 Then we head back to the E6 continuing through the midlands. 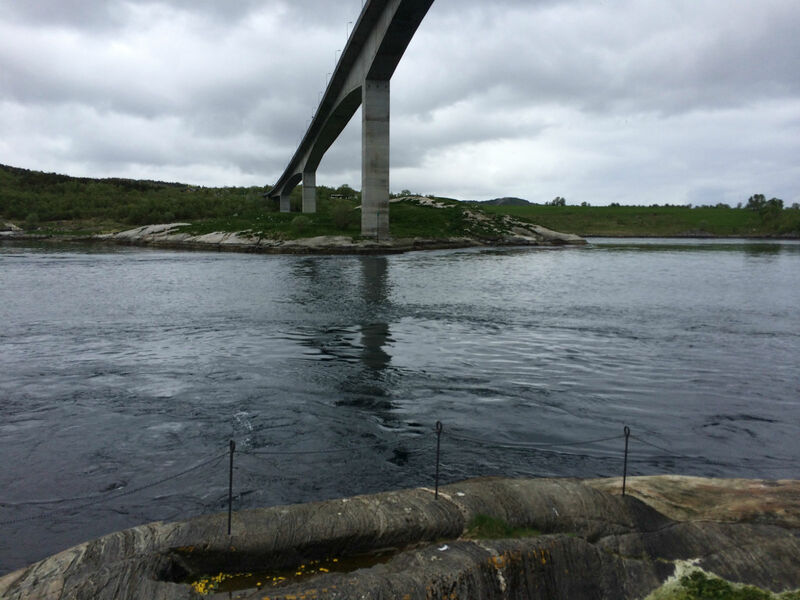 There is also the opportunity to take the coastal road FV18. 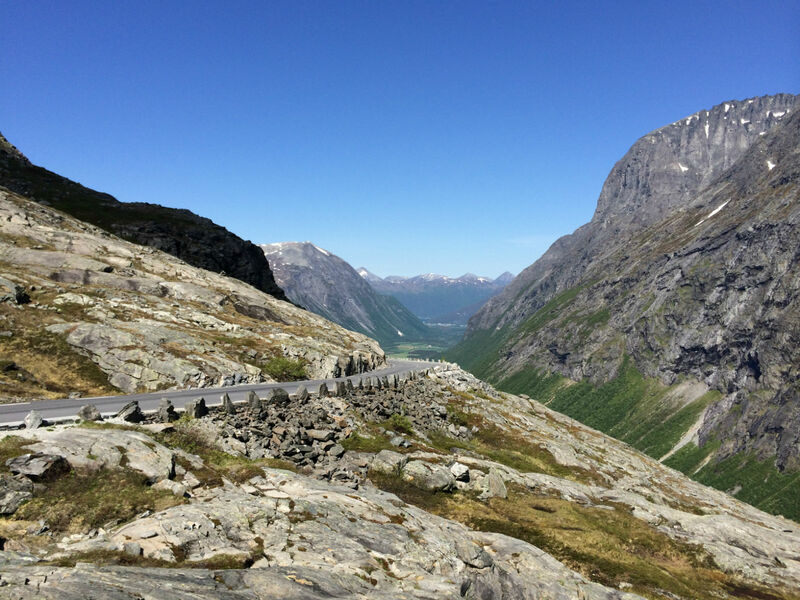 Scenically this route would certainly be worth it, but the ferry trips cost a lot of time, and we would like to reach Trondheim the next day, so we opt not to take the scenic route. 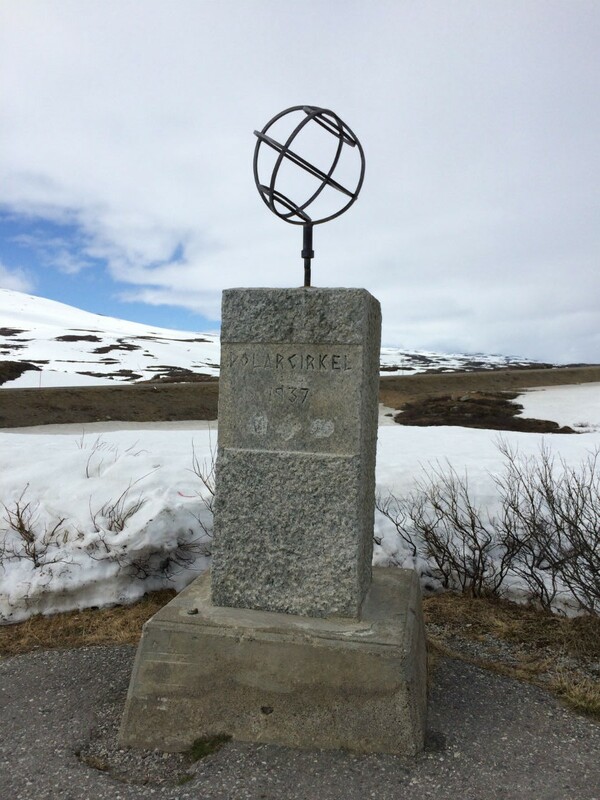 Aproximately 80km before Mo i Rana we cross the Arctic Circle once again. 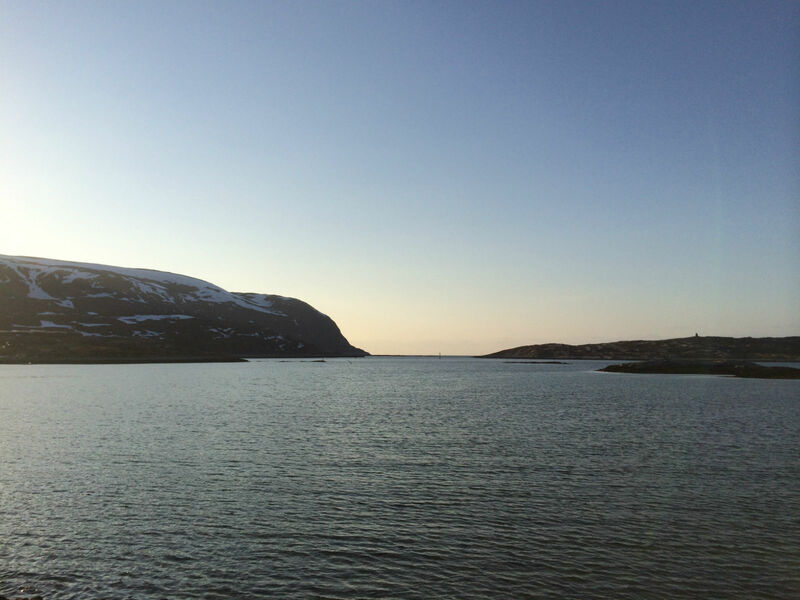 Now the nights will also be getting darker again. 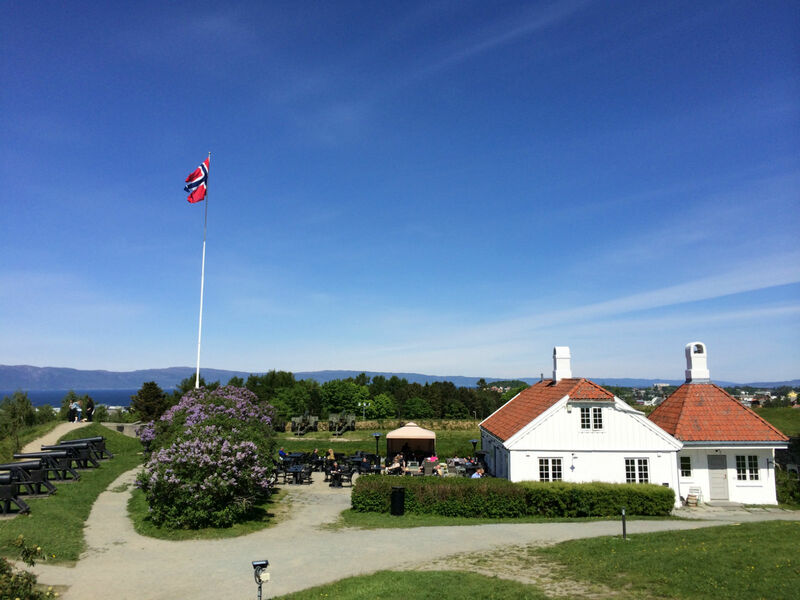 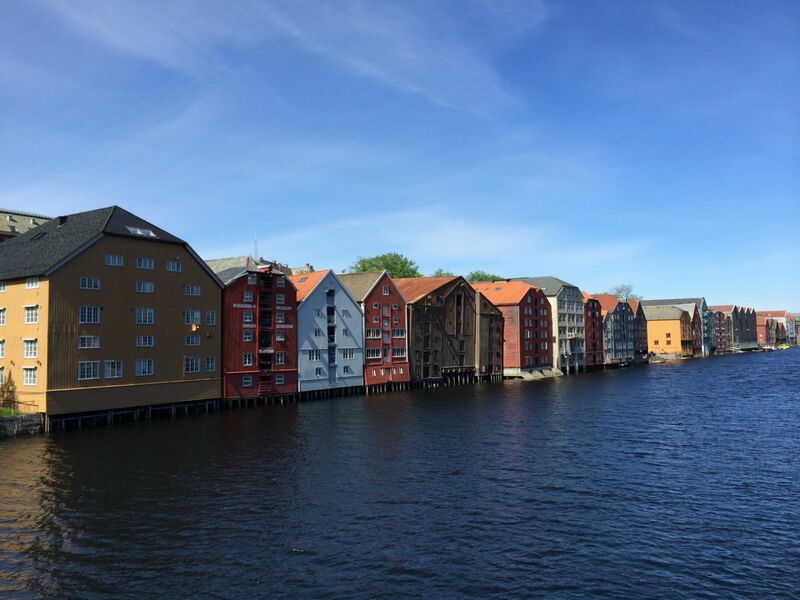 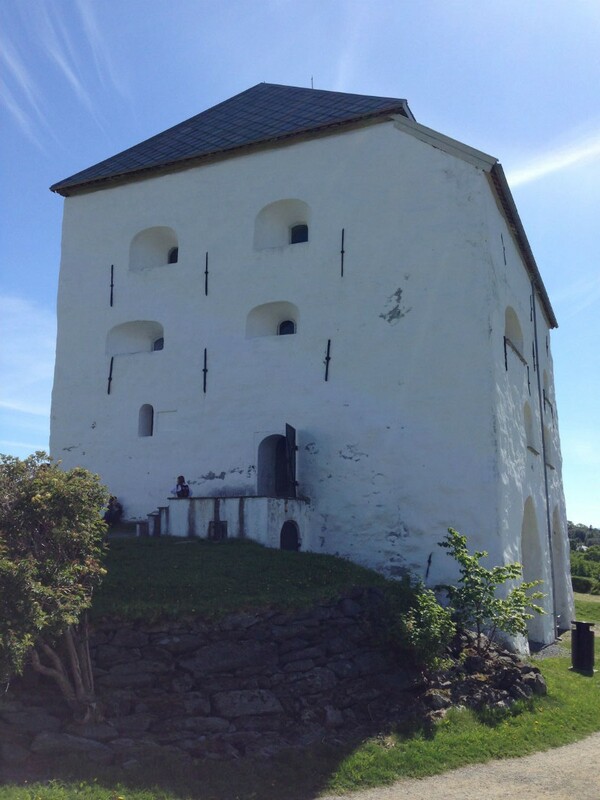 1 June, 2014 – In glorious sunshine we arrive in Trondheim, we park at the Kristiansten Fortress and visit the free exhibition. 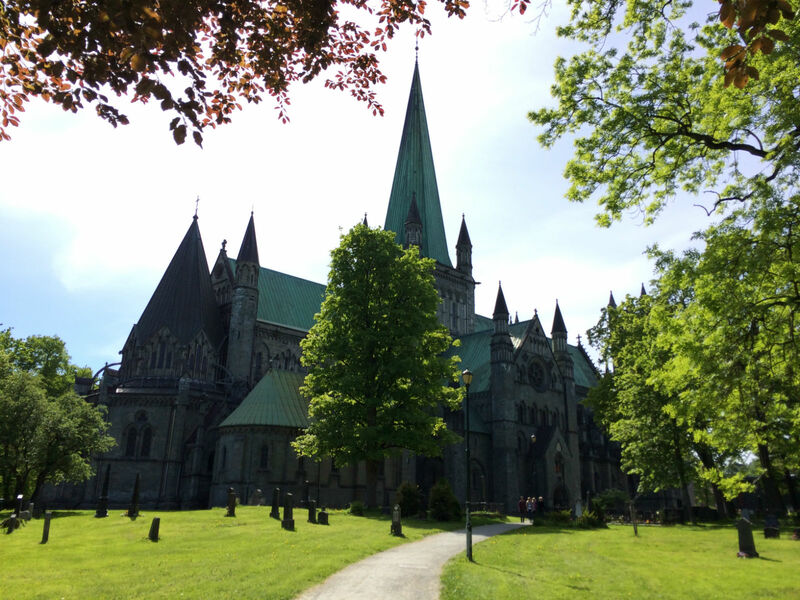 Then we go down the hill to visit at the Nidaros Cathedral in the Old Town. 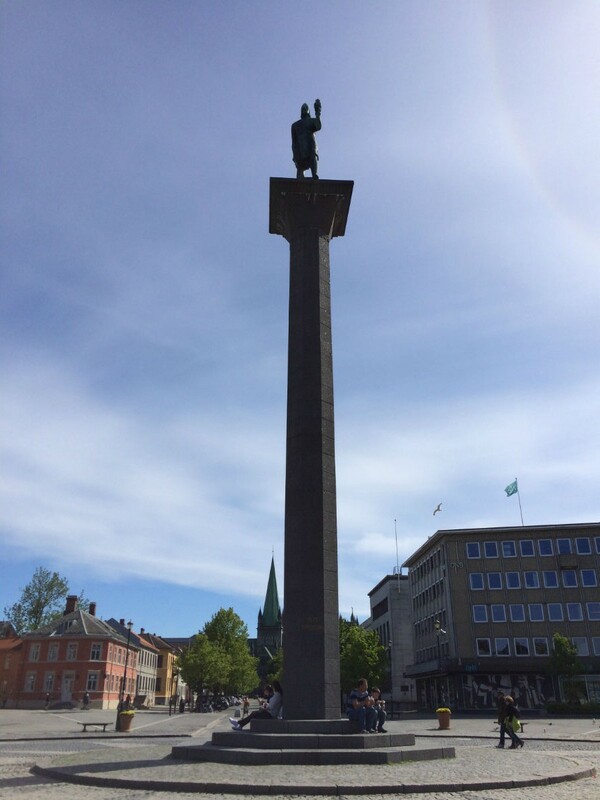 Here the kings of Norway are still crowned. 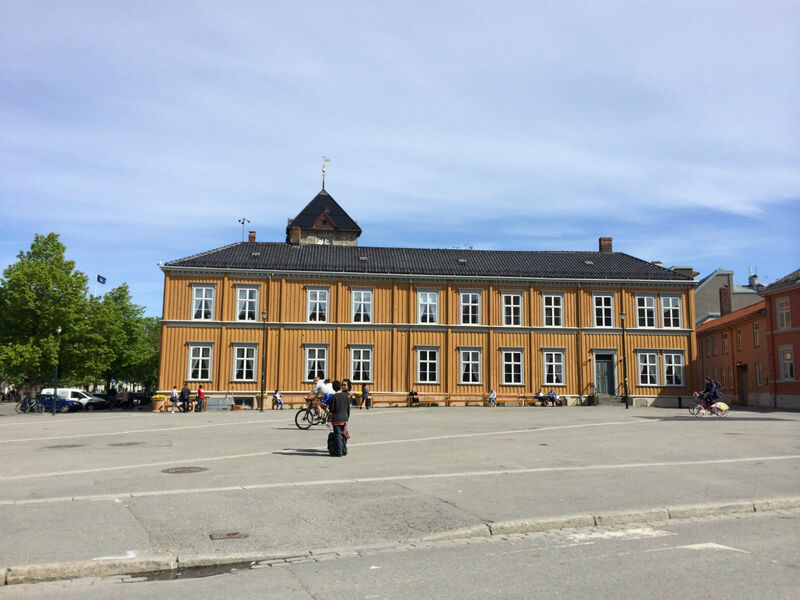 Then we go along Munkegata to the town hall, market square Torget and pass Stiftsgården to the fish halls. 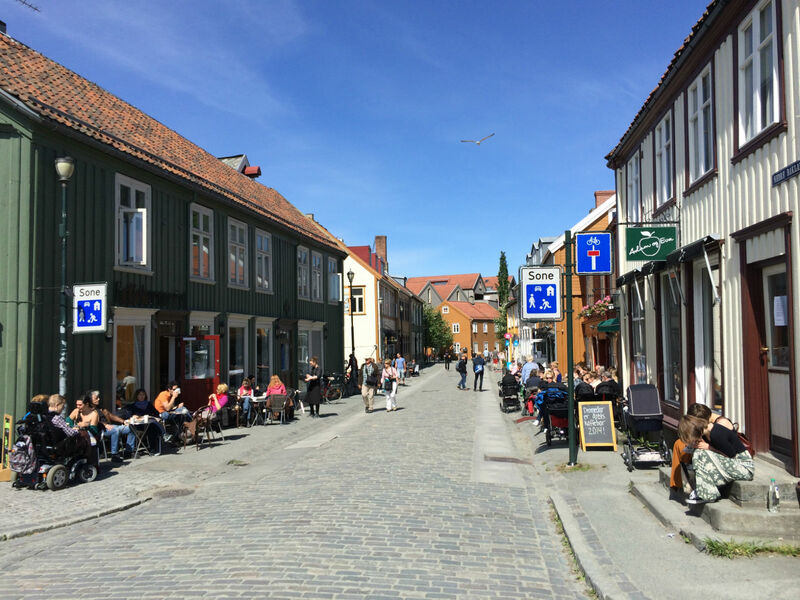 Unfortunately, it is Sunday and the shops are closed, but the numerous cafes are well attended. 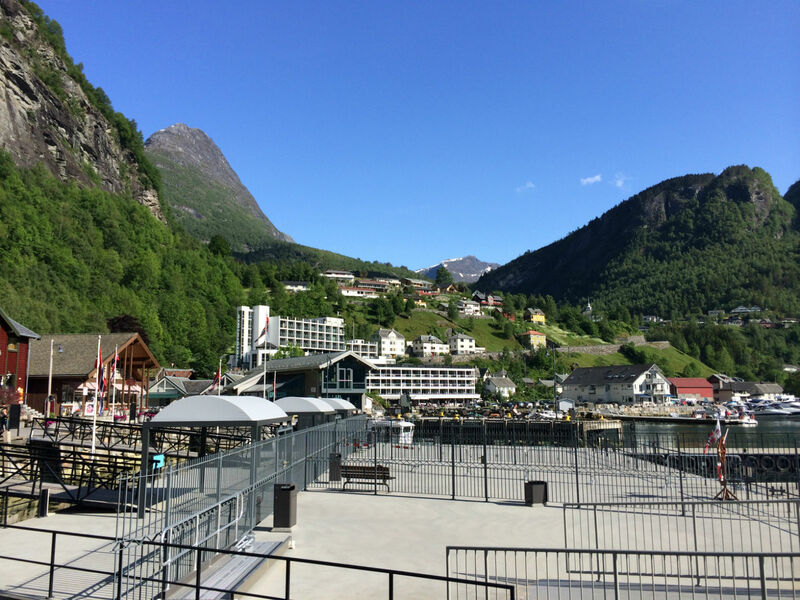 On the way back to the fortress, we take a look at the old warehouses from the wooden bridge, Bybrua. 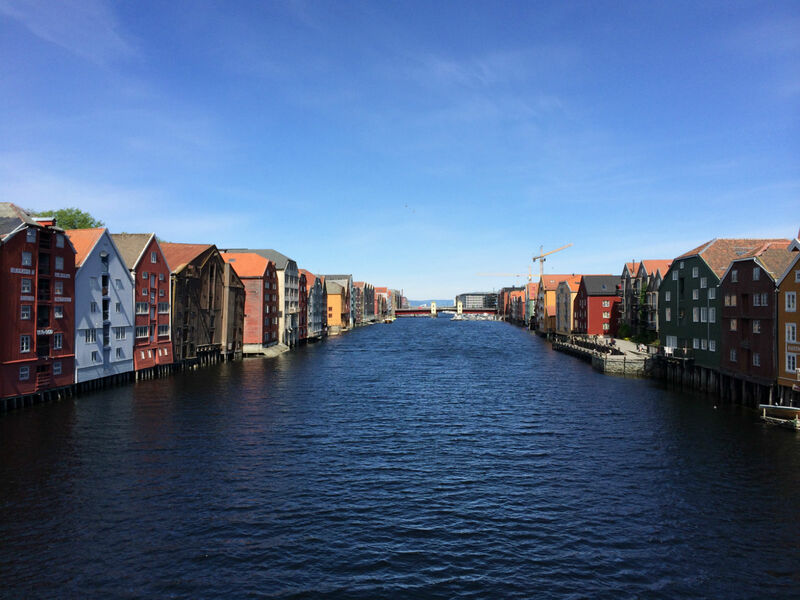 The city sightseeing was a welcome change to all the nature of the last few days. 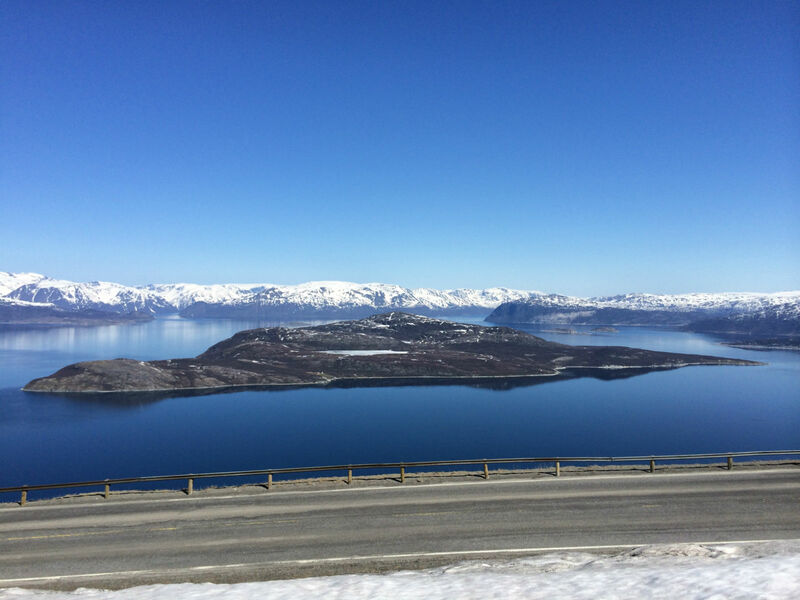 Then we head on, taking the E6 towards Oppdal. 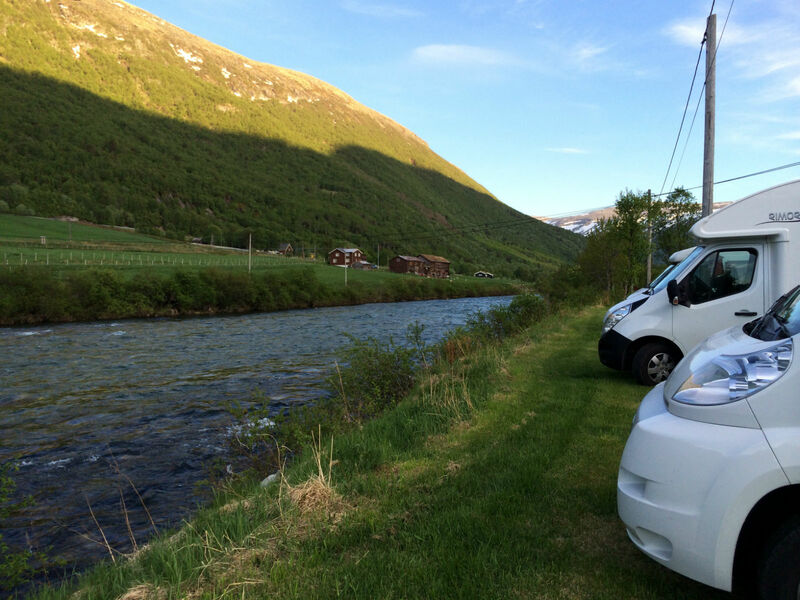 We find the cheapest campsite Magalaupe, located right on the river Svåne. 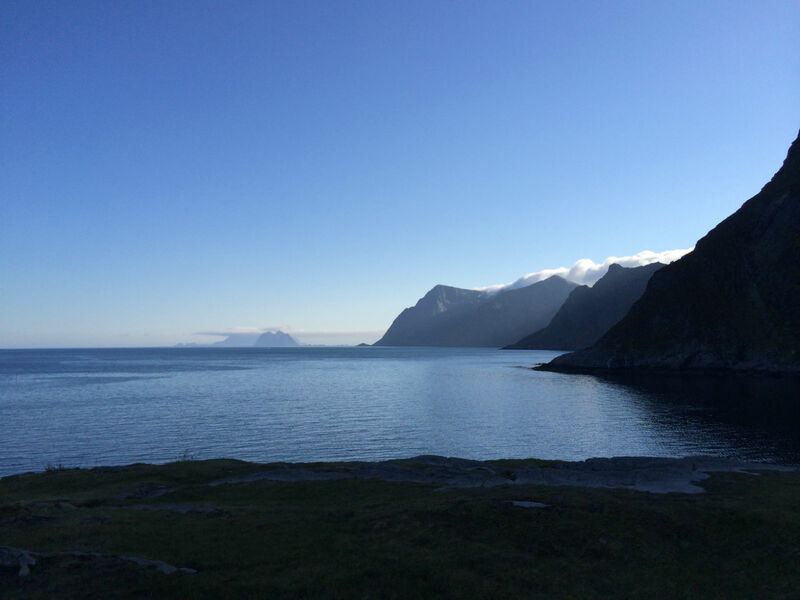 As temperatures are also now once again milder, we can comfortably BBQ in the evening. 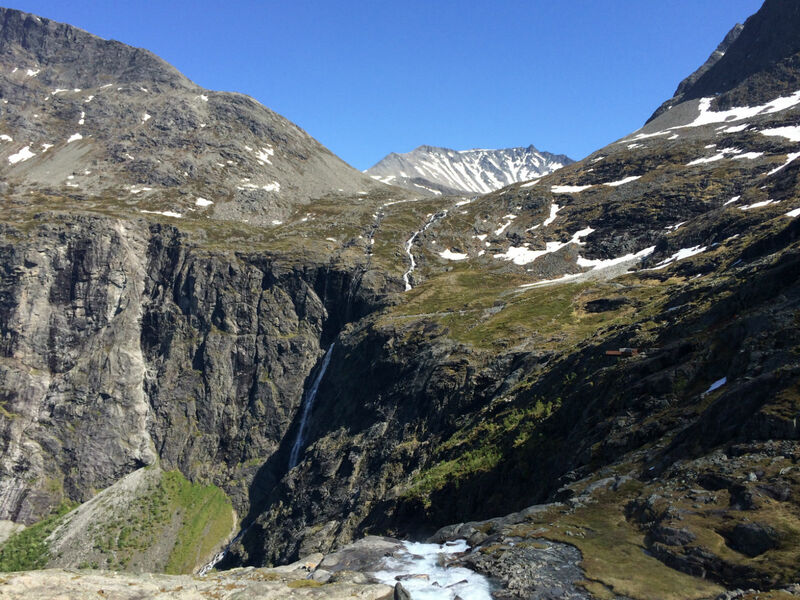 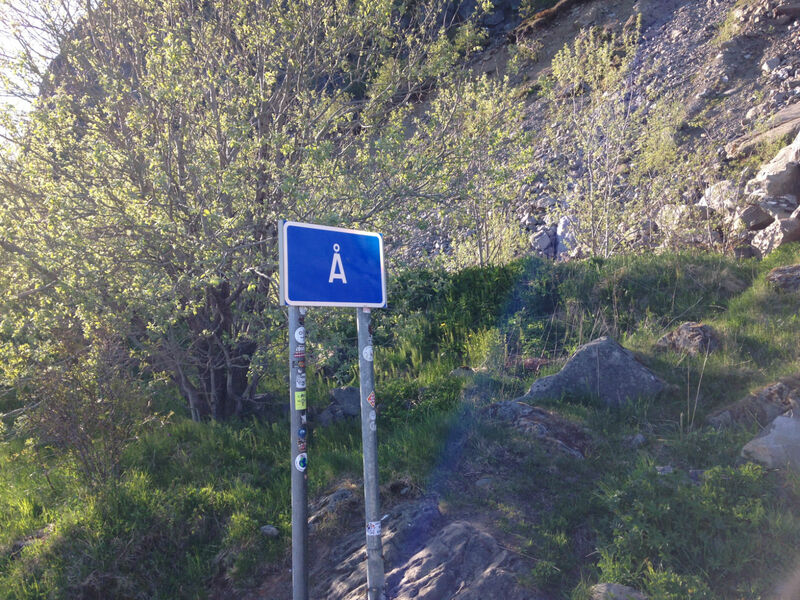 2 June, 2014 – We start from the campsite onto the E6 and then turn right onto the E136. 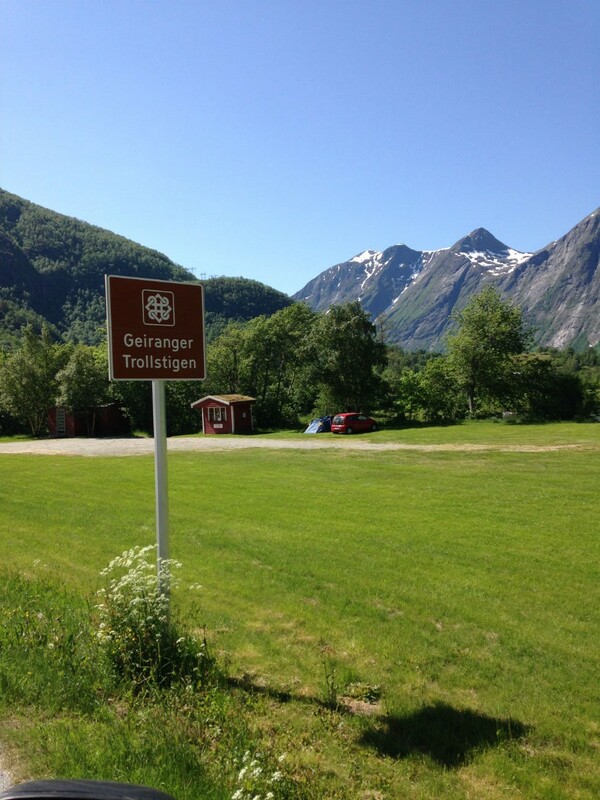 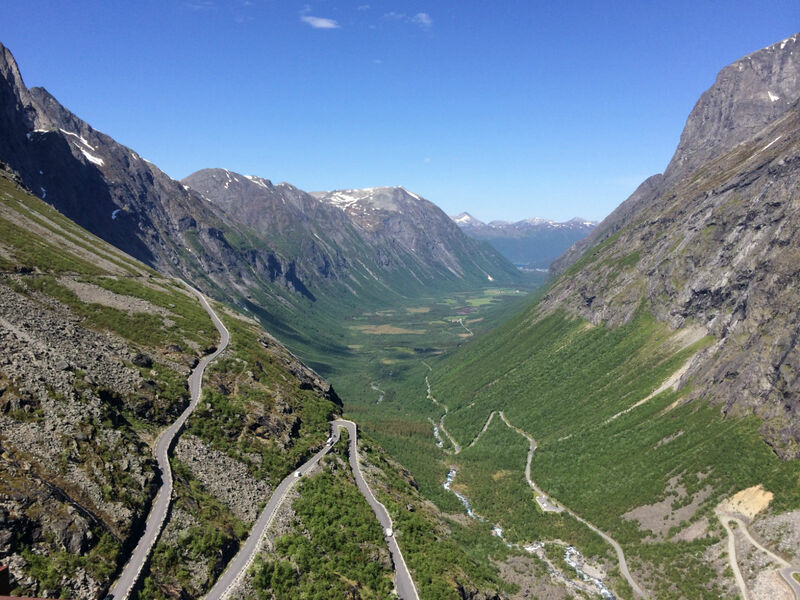 Shortly before Åndalsnes, we turn left onto the Rv63, to cruise along Trollstigen. 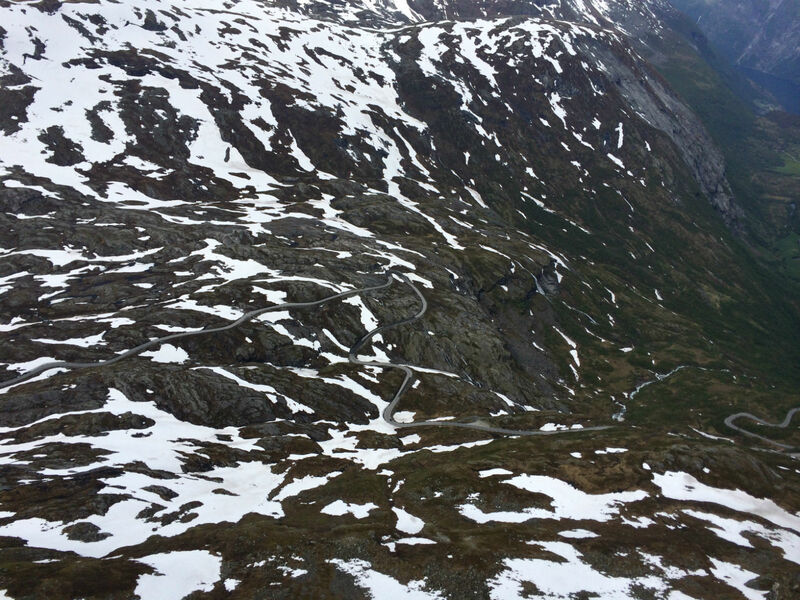 Caution, this route is mostly only passable from May/June to September. 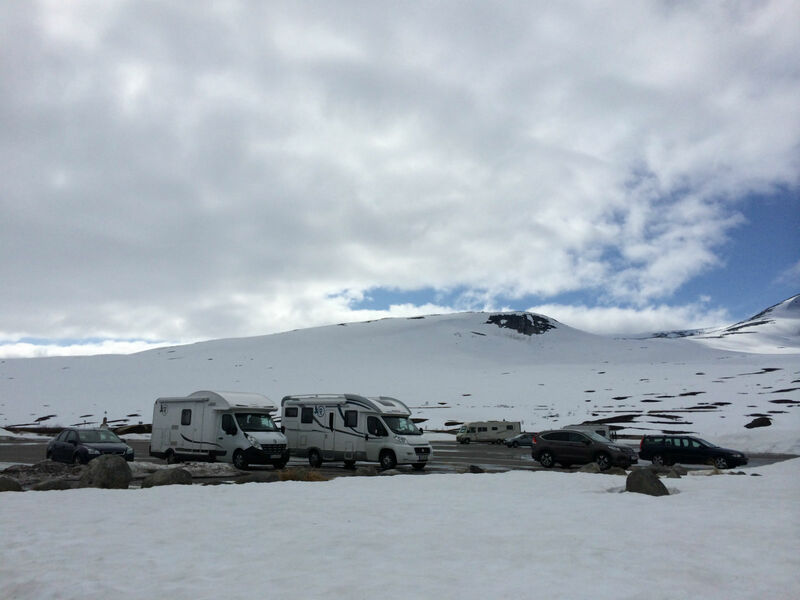 We are lucky, we can drive up the well-built serpentine road with our campers in the best weather. 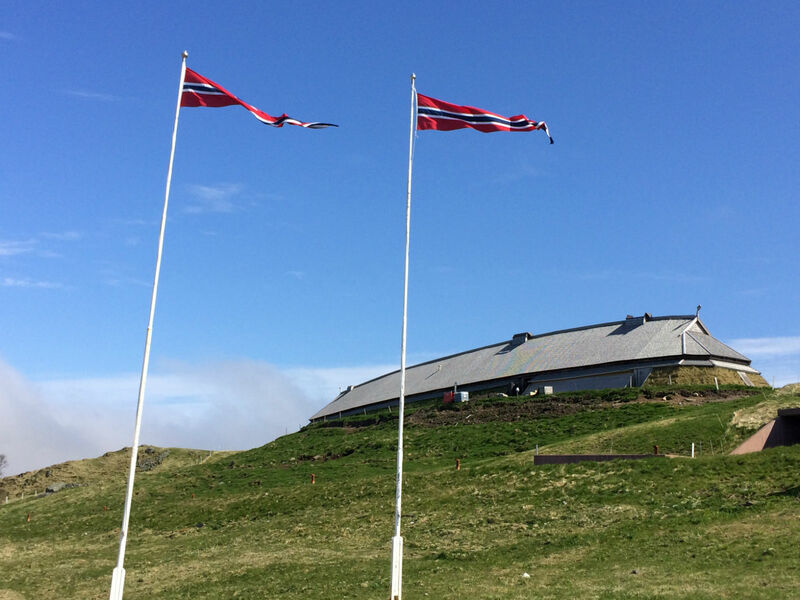 On top awaits us, next to the fascinating mountain scenery, a well-developed visitor center with viewpoints and walking trails to a waterfall. 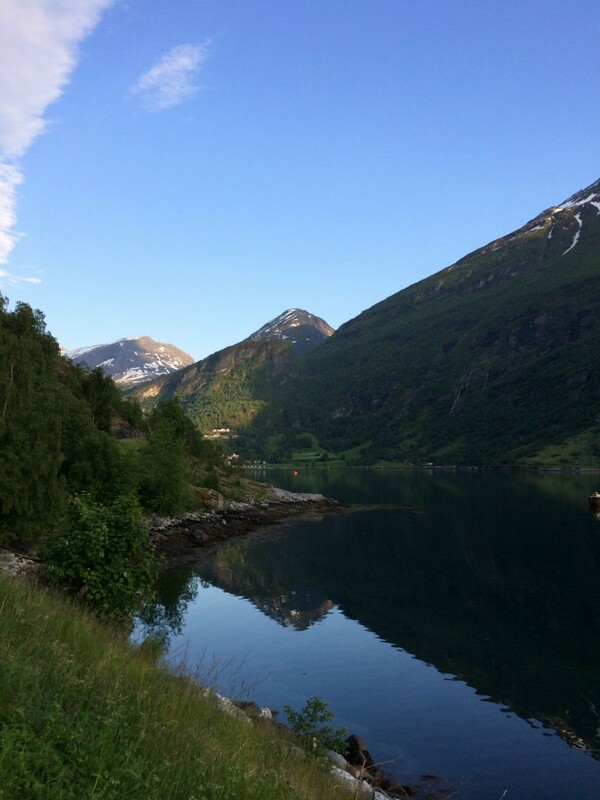 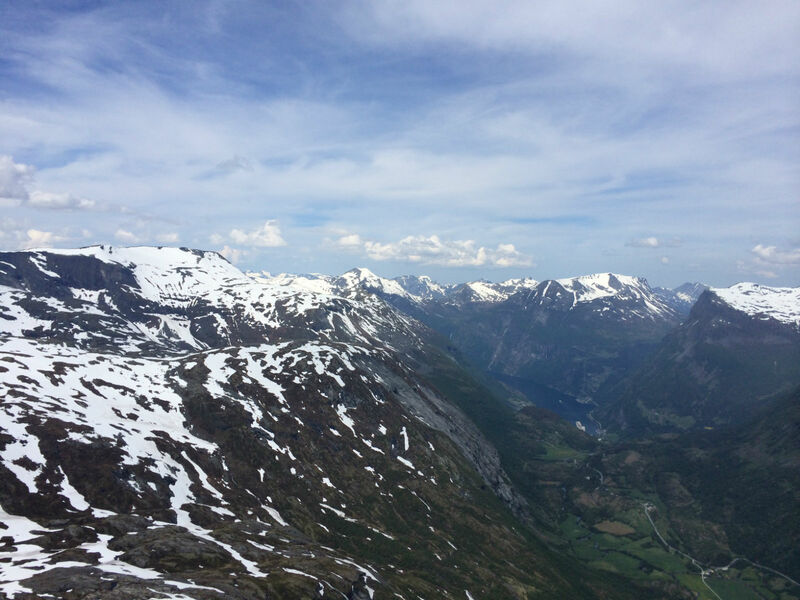 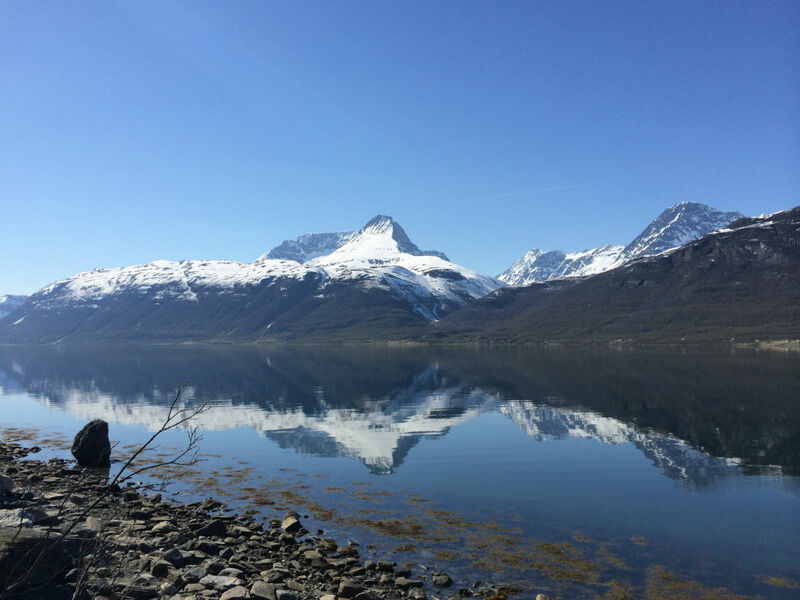 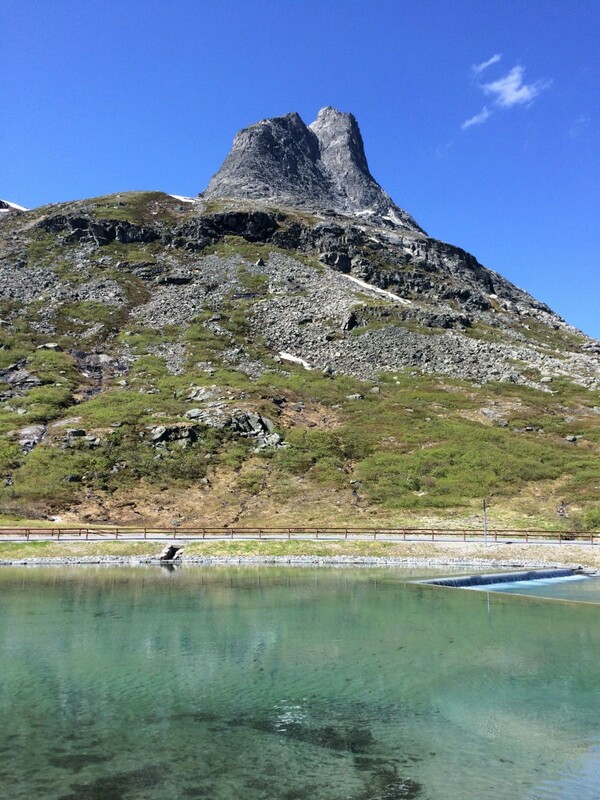 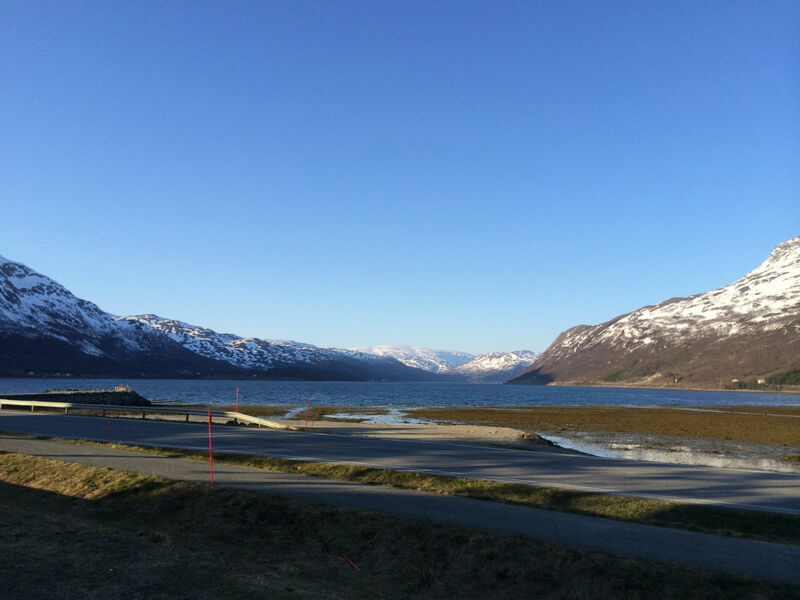 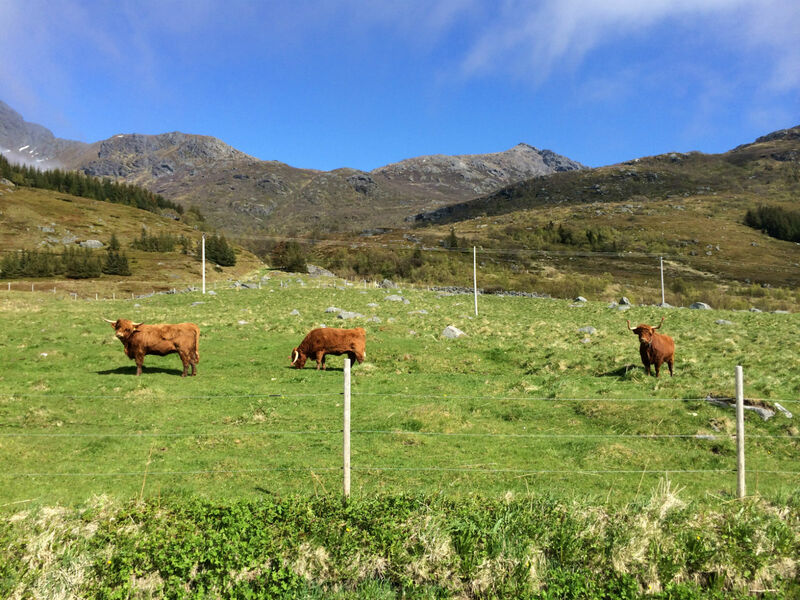 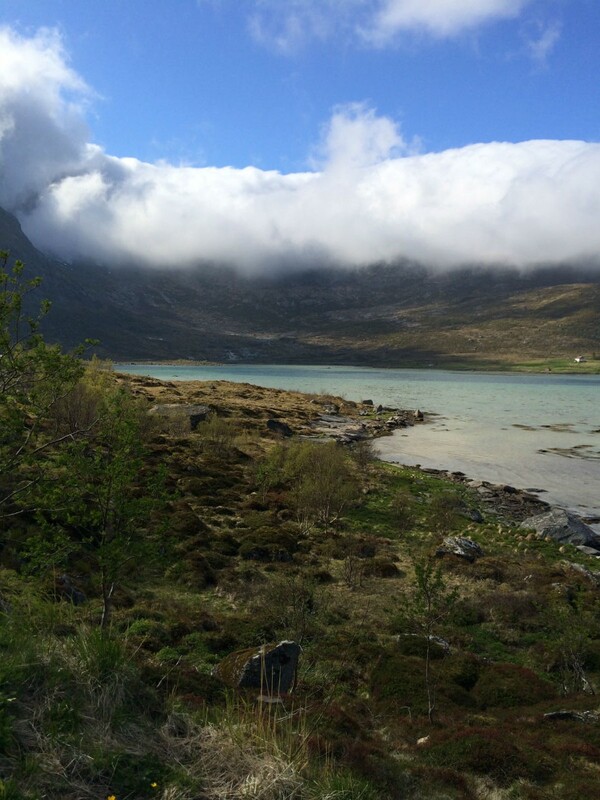 We drive to the village of Geiranger and amble around a bit. 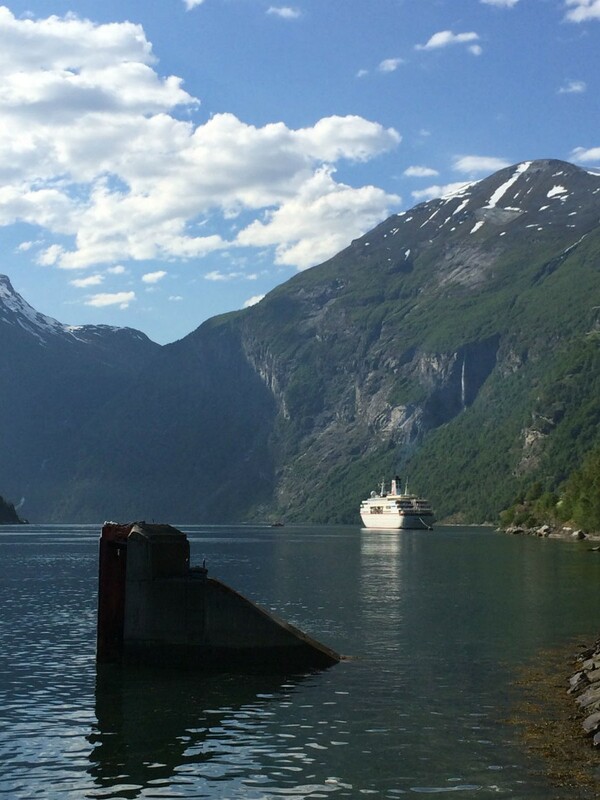 Of course, everything is designed for the many cruise ship tourists. 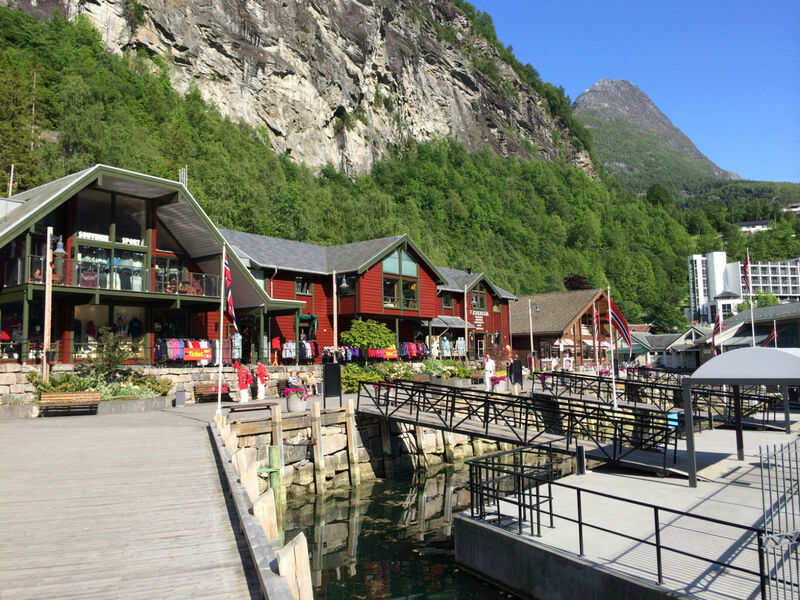 There are several souvenir shops and small, sometimes hidden restaurants along the water. 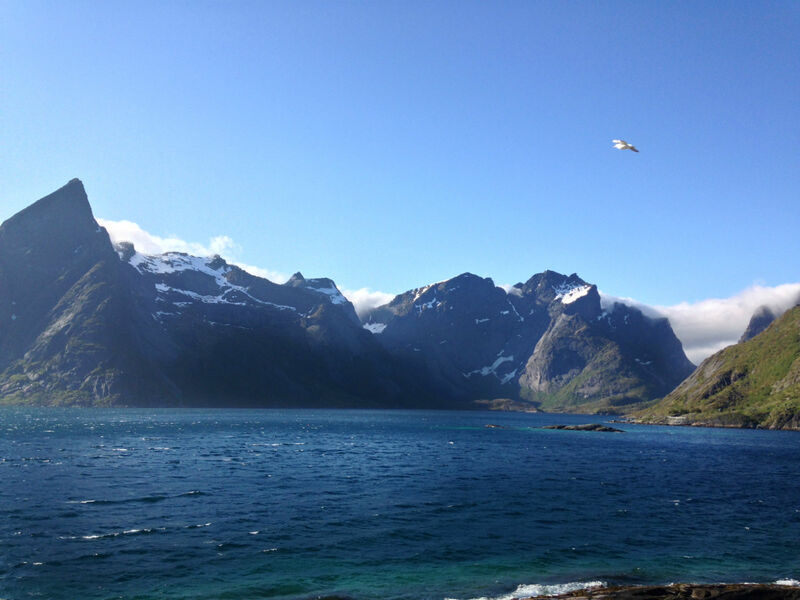 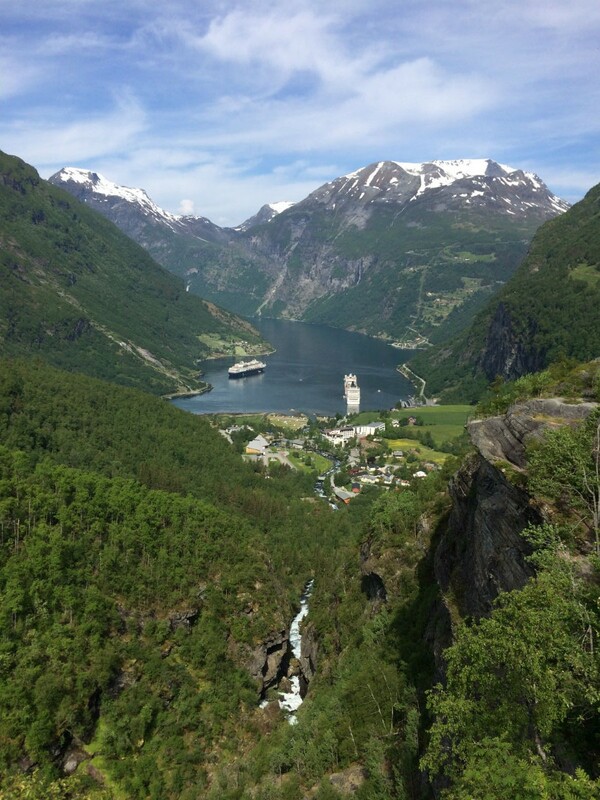 But we actually only have eyes for the incomparable beautiful nature of Norway. 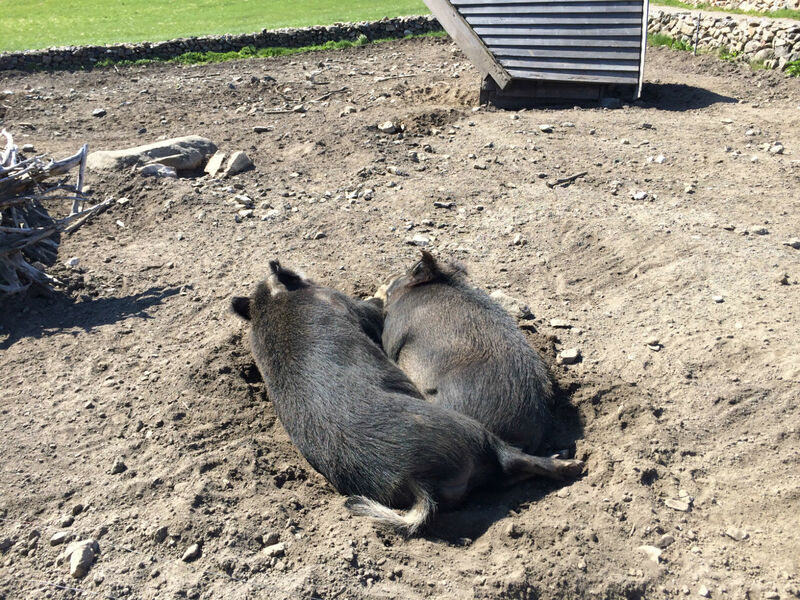 Obviously we will sleep here tonight! 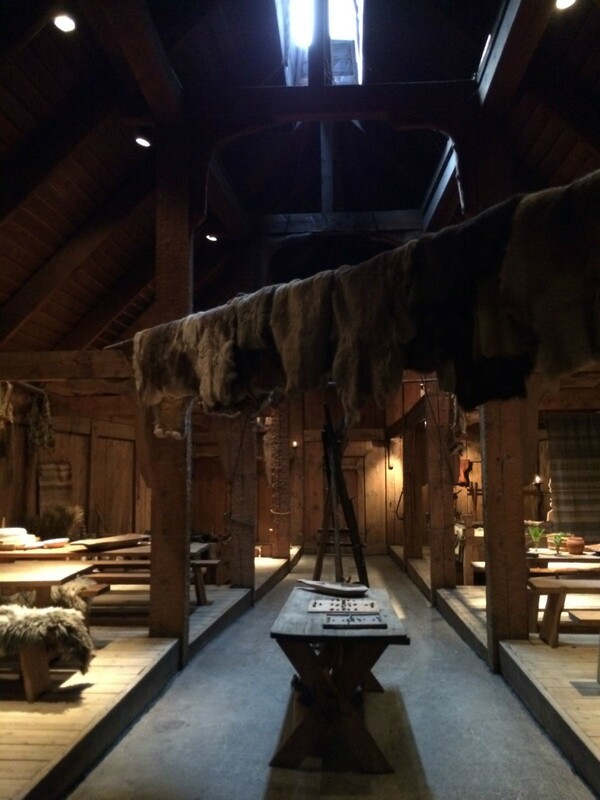 Here we are again grateful that it’s the preseason. 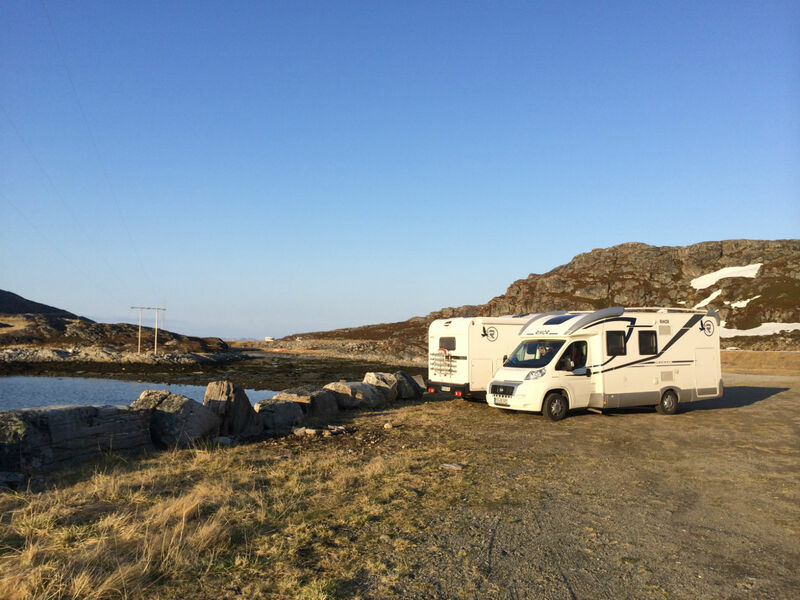 We don’t head to a camping place, but instead find, located on a small parking lot right on the shore, space for our campers. 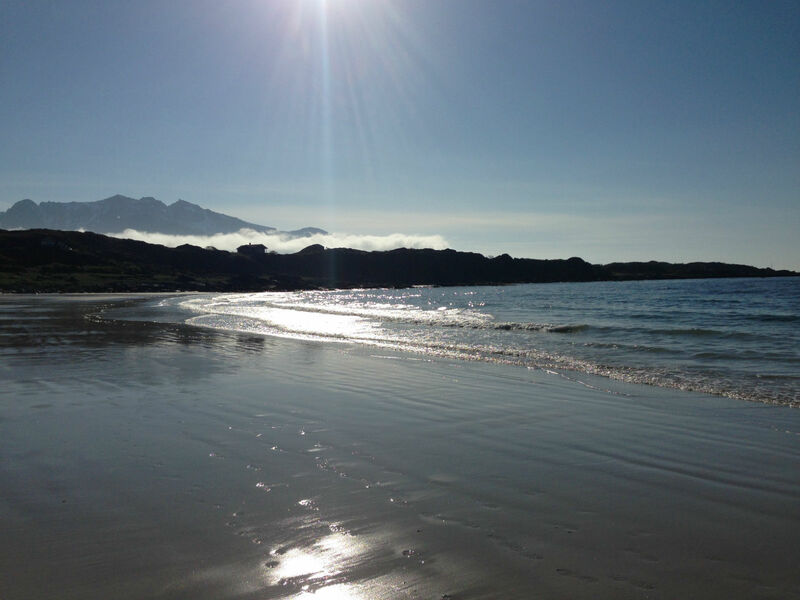 There we enjoy the view and the sun’s rays in deckchairs. 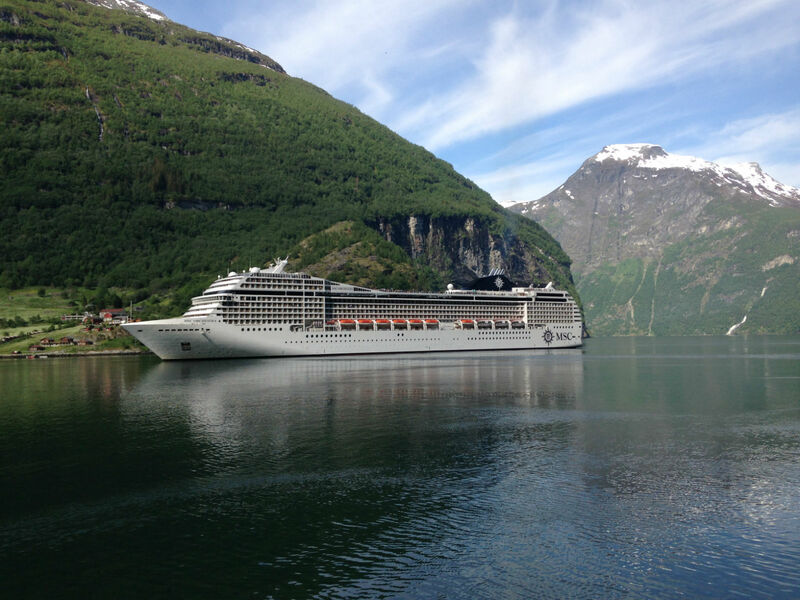 3 June, 2014 – The next morning we are awoken by the horn of the MSC Orchestra. 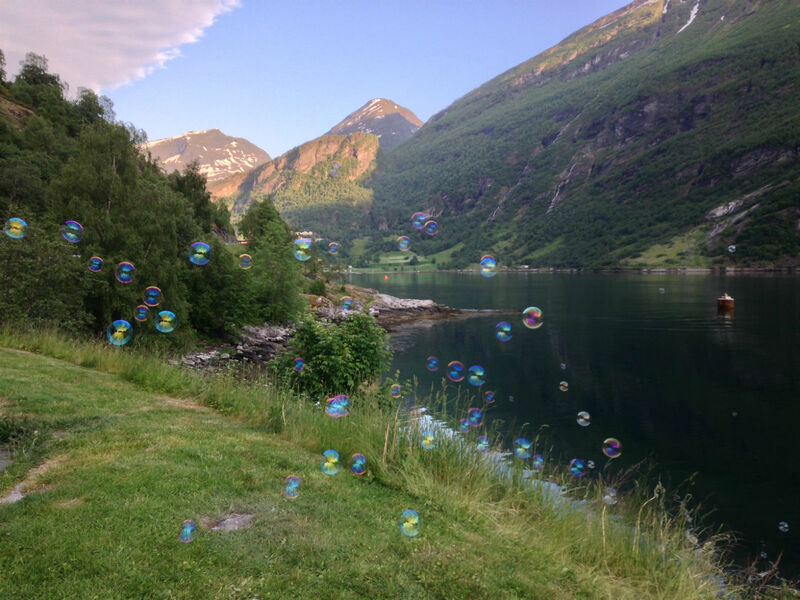 We also need to do that! 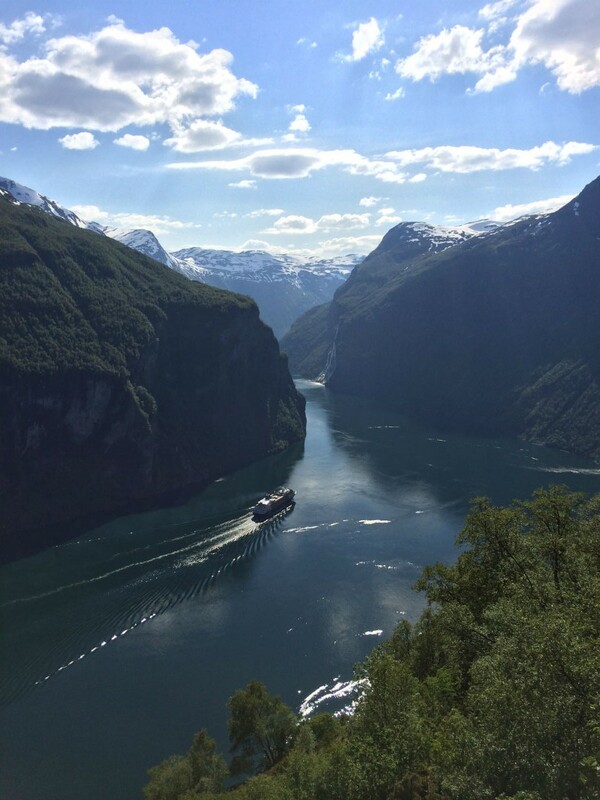 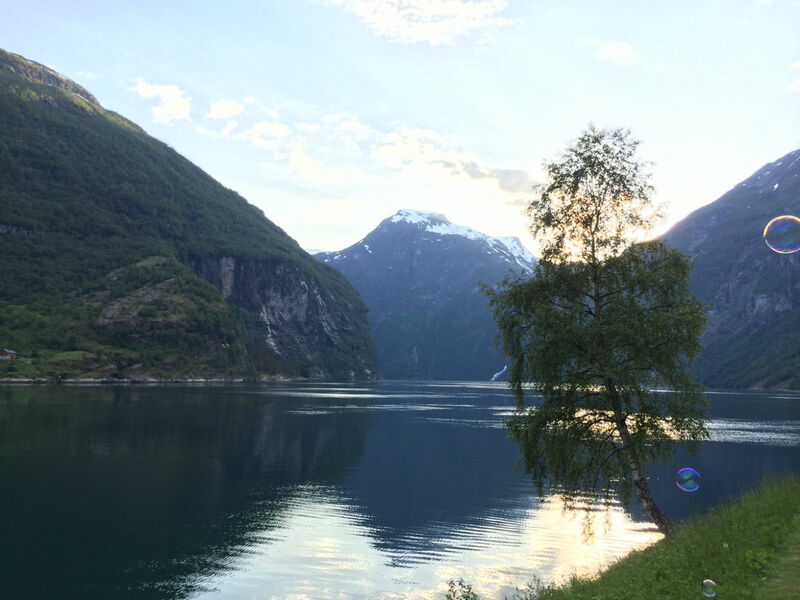 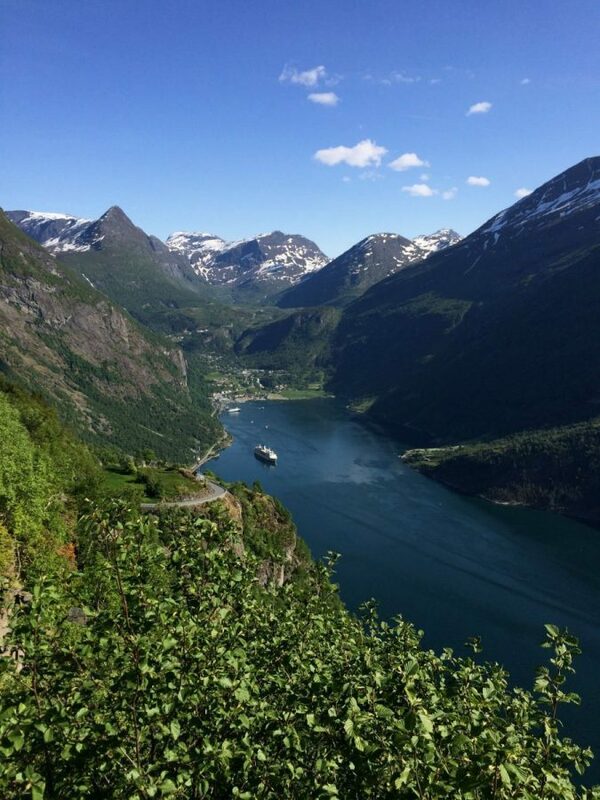 With a cruise ship to Norway and through the Geirangerfjord; then we will also see the waterfalls “The seven sisters”, “Free” and “Bridal Veil”. 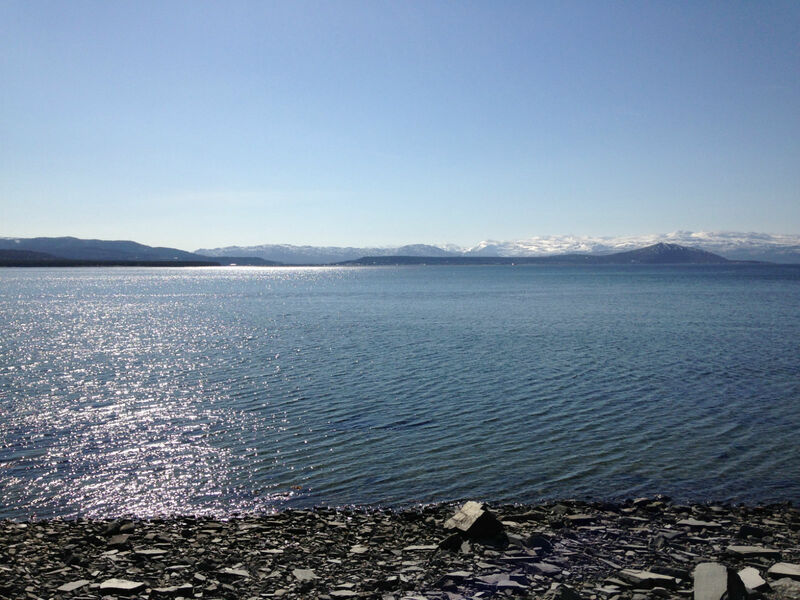 This is probably the best breakfast view on our trip! 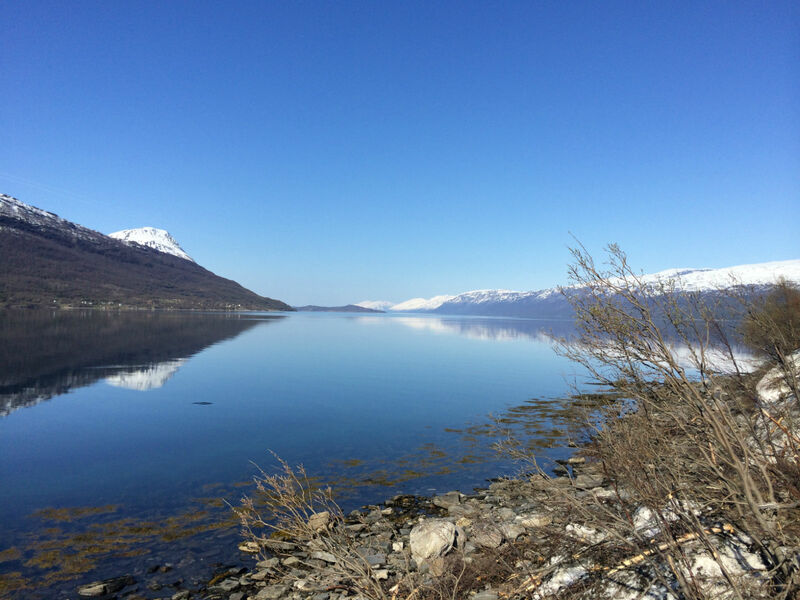 Then we go on the Rv63 onward to Hotel Djupvasshytta. 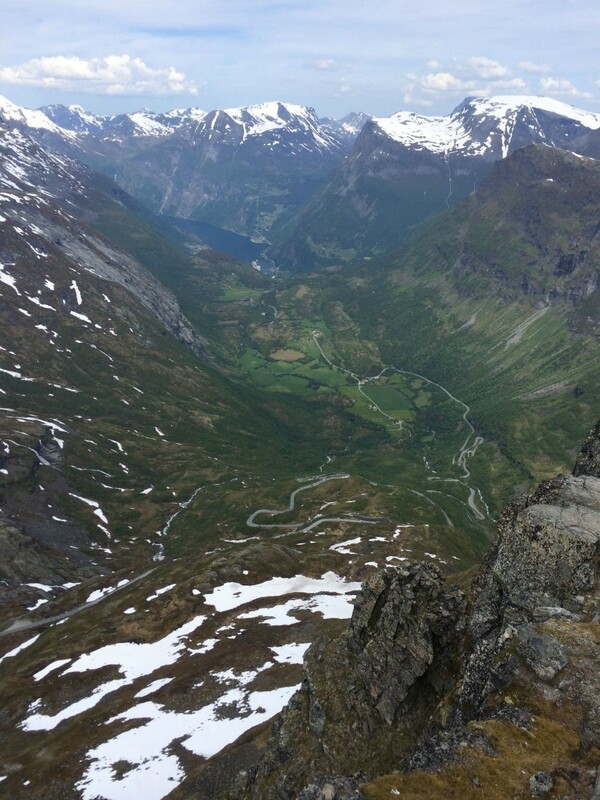 Along the way, we stop again at a view point. 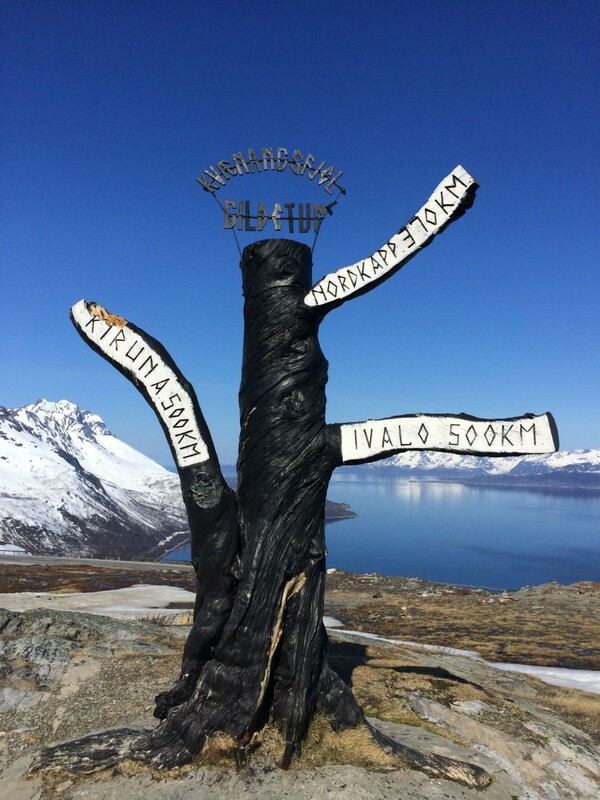 When we arrive at Hotel Djupvasshytta we turn left into Nibbevei. 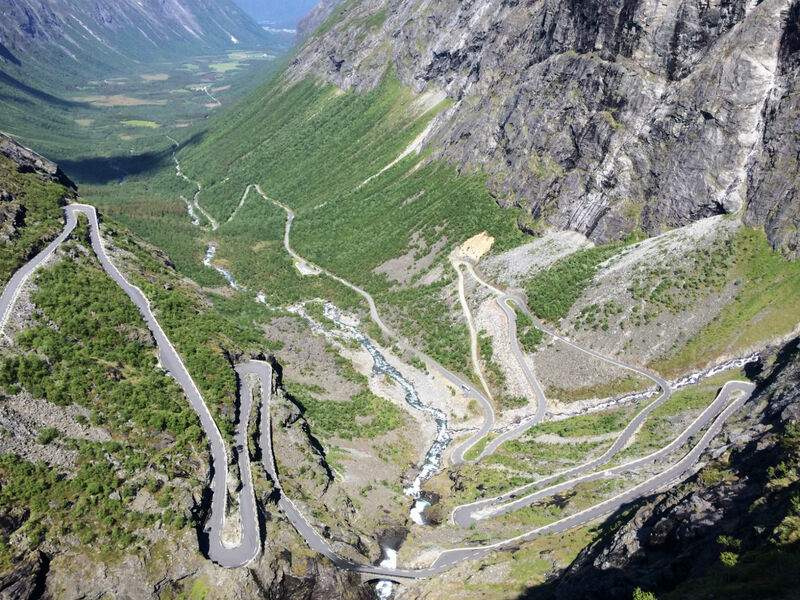 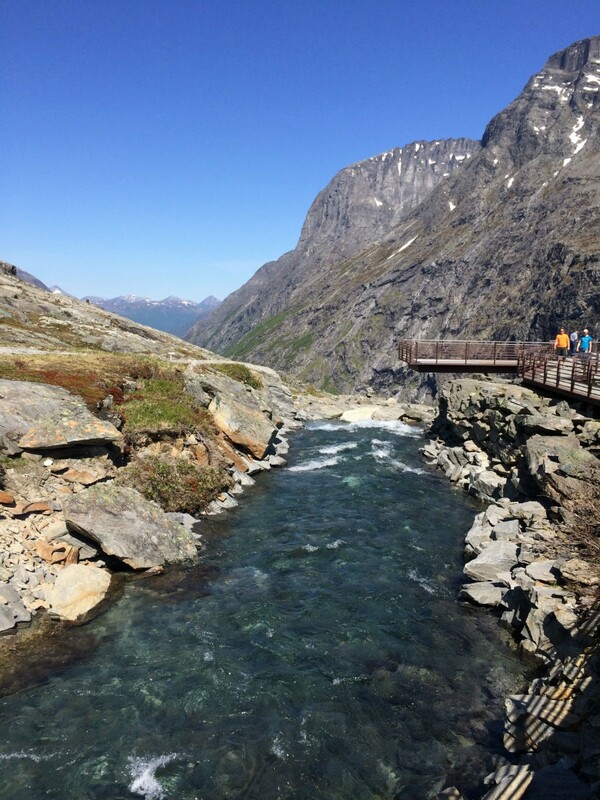 The toll road leads us onto serpentine, to the almost 1,500 meters high Dalsnibba and offers a unique view onto the fjord and the surrounding mountains. 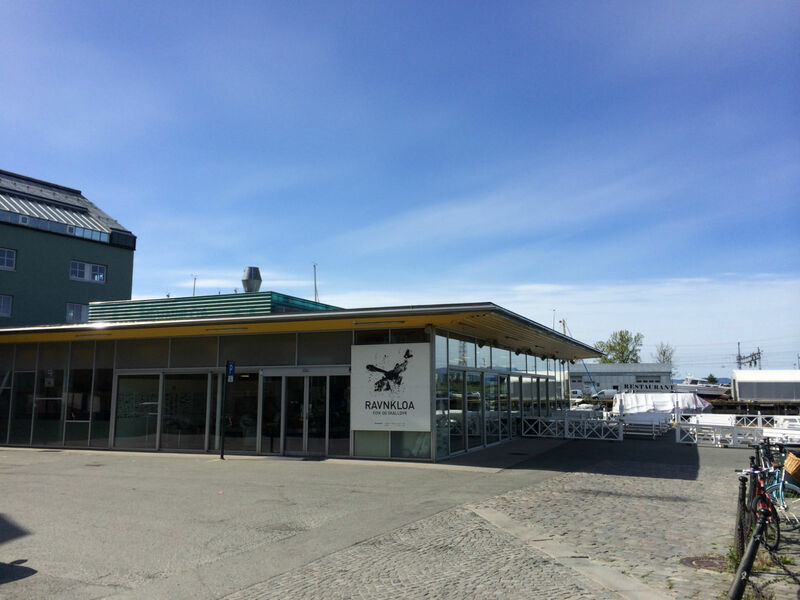 Following the Rv15, RV60, RV5 and E39, we then go towards Bergen; between Lavik and Oppedal, again with a short ferry ride. 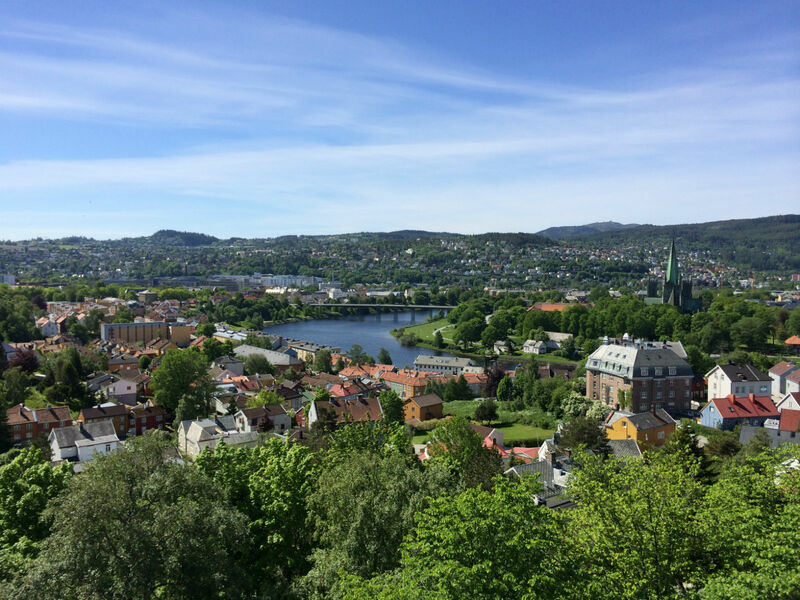 Shortly before Bergen we look for a place to stay. 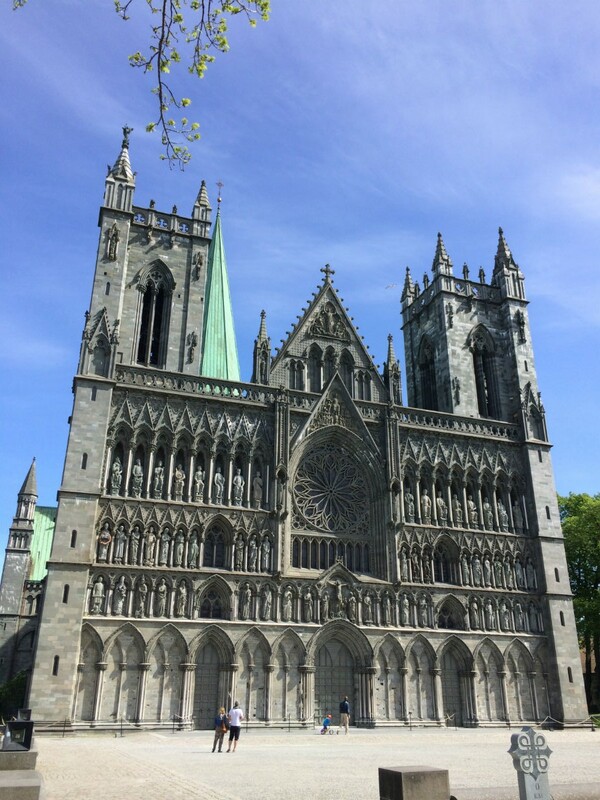 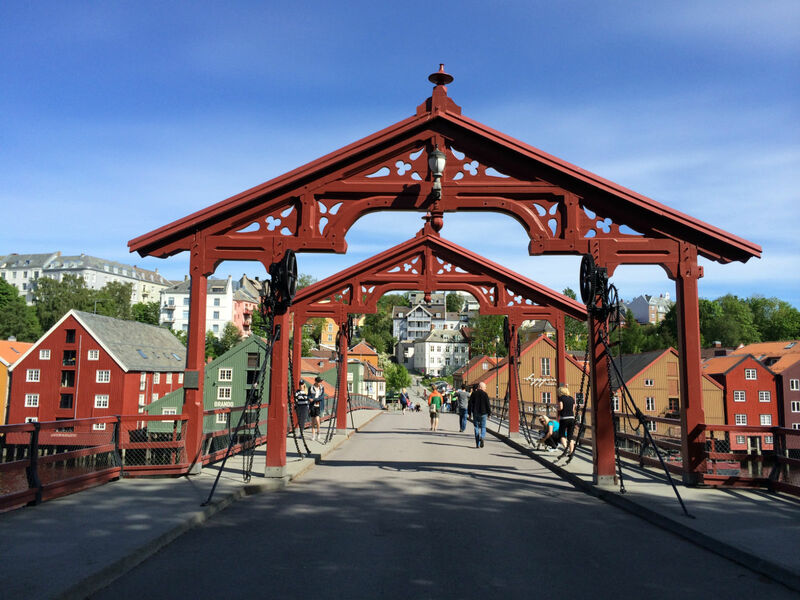 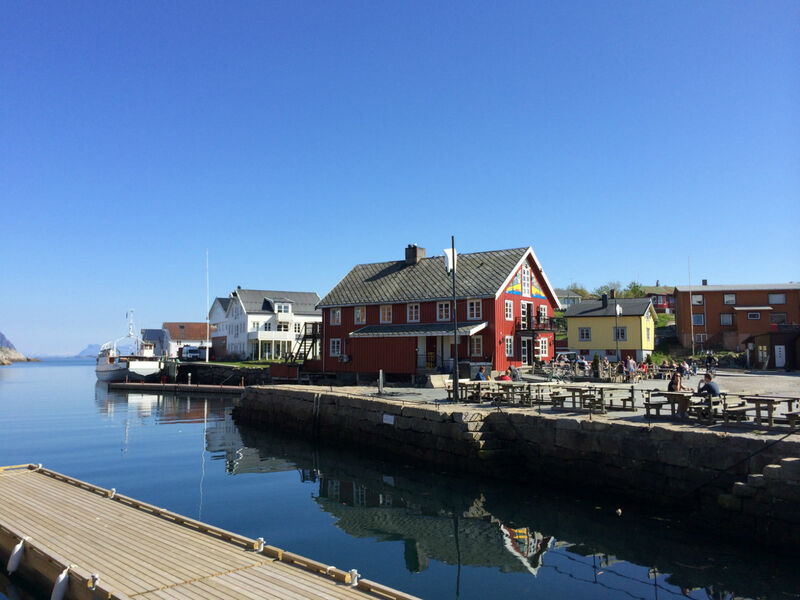 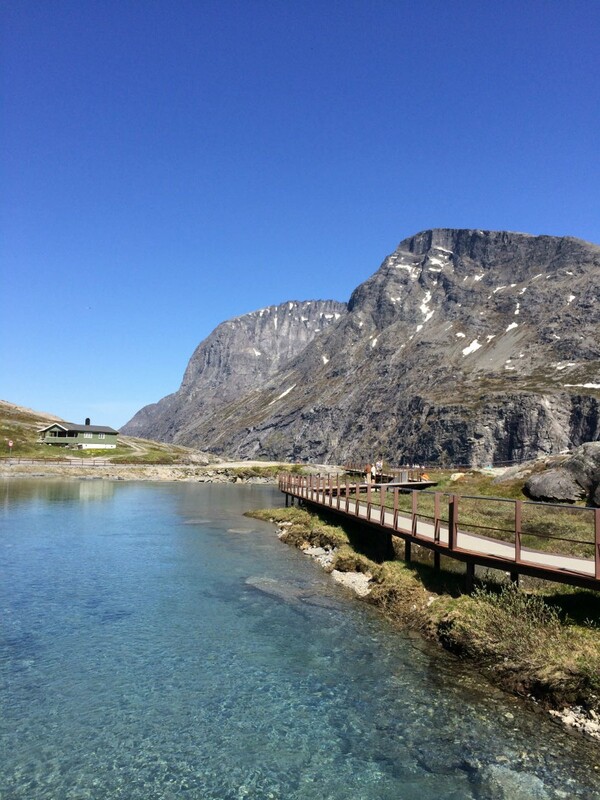 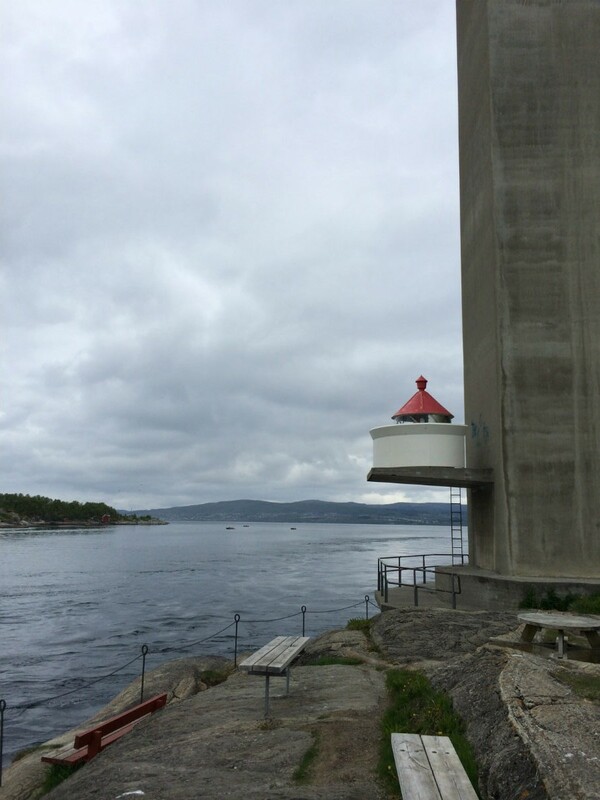 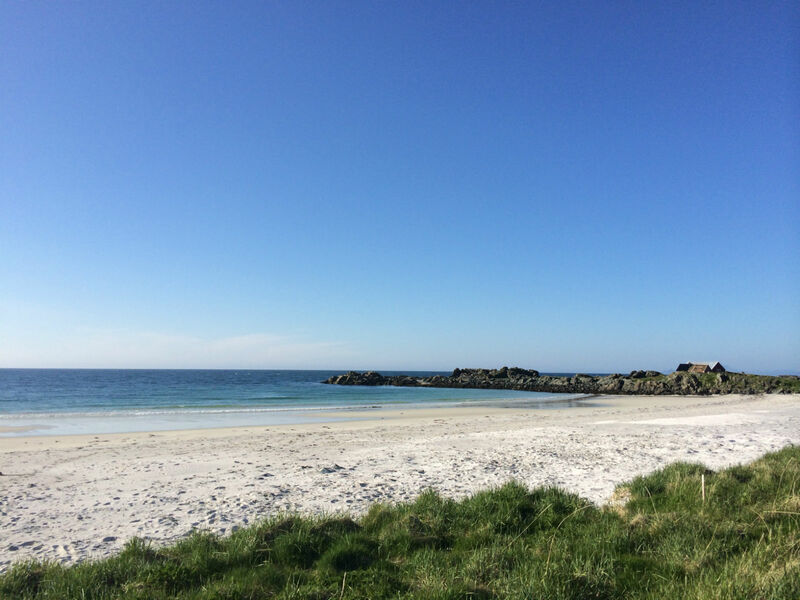 Our visit to Bergen, the onward journey through Norway with Stavanger, a walk to Preikestolen, Oslo and Gothenburg in southern Sweden can be found in the 4th and final part of our tour.